One of the great challenges in digital ad security is the fact that the bad actors always start this race in the lead. Whenever the legitimate ad industry gets to work eradicating one security threat, malvertisers find another point of entry to deploy their sinister wares. For the past couple of years, the industry has had its sights on auto redirects, which can abruptly end the user’s session, prevent the affected publisher from monetizing that session, and potentially damage that user’s trust in the publisher’s site. The fight against redirects is ongoing. And now it’s complicated by a new attack vector—vulnerabilities in the commonly-used web WebRTC protocol. Those vulnerabilities are now responsible for a quarter of all identified redirects. WebRTC is a framework that facilitates audio and video calls and chats across different web browsers and mobile apps, including VoIP tech (i.e., web phones). It’s used by a large number of major digital companies—Google, Apple, Microsoft, Mozilla, Opera. Back in 2015, media outlets reported WebRTC had a security flaw that could expose users’ real IP addresses. At that time, this was treated as a risk for users who wanted to browse anonymously. Now, malvertisers have gotten in on the game, using that same point of entry to unleash redirects on users. This rash of redirect attacks is particularly sinister because they take advantage of WebRTC, which is a distributed peer-to-peer service. Blacklisting doesn’t work here as a security method, because there’s effectively no server or domain to blacklist. The perpetrator of the attack will send the request for a redirect to a STUN server, which itself can’t be blocked because it’s used by legitimate companies (Google, Microsoft and so on) running legitimate scripts. If you were to block these attacks, you’d block any data from major cloud-based services. The scammers’ strategy gets sneakier from there. WebRTC allows bad actors to identify whether the user already has a public IP or is outside of the targeted range for their attack. It even allows them to identify whether the “user” is likely to be a real person or merely an emulator set up as a security measure. If the user does not seem to be a real person within the desired range, they’ll simply be shown a legit ad from a third-party programmatic ad platform. If they “pass muster,” they’re served a redirect code. And now the perpetrator also has logged their VPN, IP and local network addresses. In short, blocking any one entity launching these redirects is nearly impossible. Their code is written to evade at several possible security points, using channels that are already difficult to moderate because of their decentralized nature. In researching this problem, GeoEdge found some of these bad actors will evade detection even if it means leaving revenue on the table that they could potentially hijack. Technically, any form of malvertising could sneak through WebRTC. But so far, the attacks we’ve identified have been redirects. The bad actors are exploiting vulnerabilities in the programmatic marketplace. In particular, they use header bidding, which has been exploited in 87% of redirects through WebRTC. All told, our research has shown that redirects are costing the digital ad industry $325 million per year, and 24% of those redirect attacks exploit the WebRTC loophole. GeoEdge studied how these malvertisers operate by reverse-engineering scripts, discovering the malicious code, and using it to launch trial attacks. From that point, researchers could investigate how to block attacks via WebRTC without also breaking WebRTC’s functionality. Ad blockers, they found, were one possible method. However, at times, ad blocking technology can prevent WebRTC from working properly. A more effective strategy is one that is already becoming industry standard—analyzing code, recognizing when an unfamiliar script show similar characteristics or behaviors to a known threat, and blocking the problem code before it reaches the publisher’s page. This real-time approach has been embraced by a growing number of publishers in the fight against redirects from other vectors. It’s proven similarly effective in guarding the WebRTC entry point, without impeding the user’s ability to communicate with others across various browsers and devices. The fight against malicious and low-quality ads will always find its way to new fronts. As it does, all legitimate digital companies, including ad security providers, must find those fronts and engage. When the bad actors manage to evade security methods the industry has relied on in the past, it is time to develop new technology. We may not know what risks we’ll face in the future, but for now, the industry’s best bet is to move toward real-time risk detection and blocking as table stakes in the digital security game. To learn more, download the GeoEdge white paper. WebRTC Malvertising: fighting a new form of obfuscated attacks. How well are digital brands meeting consumers’ hierarchy of digital needs? Innovation fails when it does not meet the needs of people. In its new report, Digital Society Index 2019: Human Needs in a Digital World, Dentsu Aegis Network examines just how well digital technology is working for all people in society. The research, conducted with Oxford Economics, surveyed over 43,000 people in 24 countries across three key dimensions of the digital economy: dynamism (its strength), inclusion (its range of access) and trust (in data usage). Overall, the research shows the digital economy as a glass half full. A number of countries show a positive balance between dynamism, inclusion, and trust. Importantly, for these countries, the future of the digital economy is viewed in a positive light. However, the misuse of data (64%) is a hot button driving declining trust in technology. 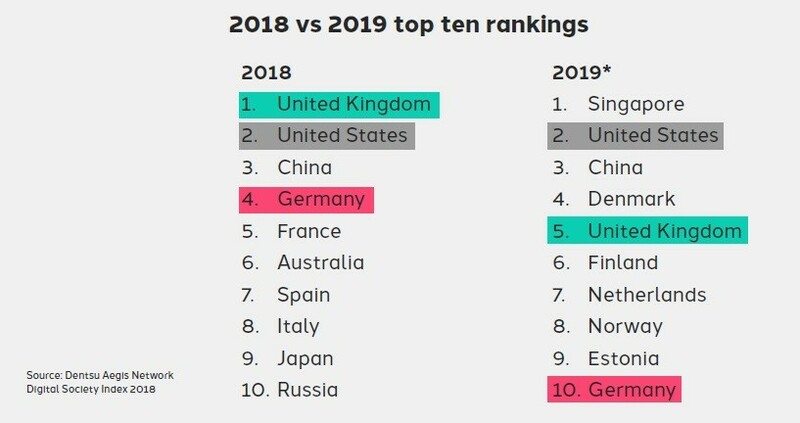 In fact, the decline in consumer trust helped drive the UK’s overall Digital Society Index ranking drop from first to fifth. Other factors include that consumers in the UK think that technology companies do not pay enough taxes (36%) and are establishing an unbalanced society by creating excessive wealth (28%). 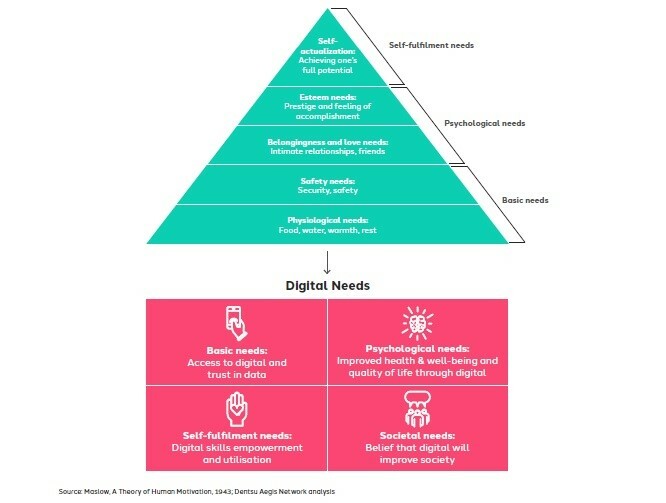 In order for digital technology companies to build a positive digital economy, Dentsu developed a new framework, based on Abraham Maslow’s work on the hierarchy of needs. It examines products and services across people’s needs. The framework includes four perspectives: basic needs, psychological needs, self-fulfillment needs, and societal needs. Basic needs are the necessary preconditions for people to engage with digital products and services. Dentus identifies basic needs as access to a quality digital infrastructure (internet and mobile connections) as well as the trust that personal data will be used responsibly by businesses and the government. Less than half (49%) of consumers worldwide (and 43% in the US) believe their basic needs of people are being met. Psychological needs include the impact of digital technologies on consumers’ health and well-being. It’s about the healthy balance of personal technology on the overall quality of life. Digital tech is helping people manage their lives from shopping to doctor health monitoring online. However, technology can be a double-edged sword, allowing for errands and efficiencies as well as the increase in obsessive online behavior. Self-fulfillment needs center on having the skills, education and opportunities to find rewarding work. Consumers show concern about their fulfilment in terms of learning new digital skills for educational or career purposes. Less than half of all consumers (45%) feel they are prepared in their usage of digital technology. These research findings suggest that employers are not doing the best job in training their employees. One in three people cannot recall the last digital training (if any) they received. Importantly, companies need to build people’s digital skills and employability to establish positive personal fulfillment. Societal needs offer opportunities for technology to help close the digital divide. Consumers are optimistic that digital technology can aid in positive changes in the world. In fact, just less than half of those surveyed believe that digital technology will enhance society to help solve key global problems. Dentsu’s research also presents behavior of new digital consumers. These digital natives are more likely to take control of their online footprint by installing ad blockers, controlling the amount of data shared and limiting time spent online. Still they are active online consumers. They are also the most likely to shop online, use an app to take a taxi or stream music. It’s important for companies and brands to understand the digital audience in terms of their attitudes towards the digital economy. Dentsu’s digital needs model offers a framework to inform product and service strategies from marketing to communications. The digital marketplace must strive to guide technology’s development to ensure consumers are not left behind by digital growth. Financially, it’s not the best of times for many local news companies in the U.S. Revenue losses continue as local publishers’ transition to digital platforms. While financial sustainability remains in question, overall findings from the new Pew Research Center survey show that consumers are engaged with local news. 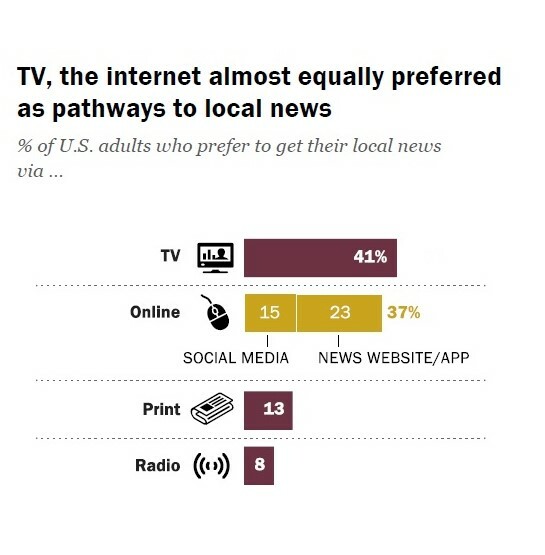 The favorite go-to for local news is TV (41%) with online access following closely behind (37%). About one in ten prefer a printed newspaper (13%) or radio (8%) for their local news. Unfortunately, despite their reliance on local news, Pew’s research also reveals that consumers are not aware their financial woes. Seventy-one percent of U.S. adults think that their local news media is doing very or somewhat well. 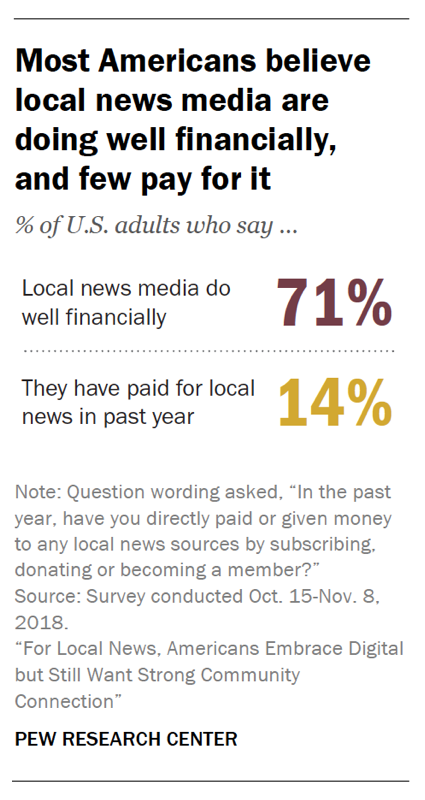 Yet only 14% directly pay a local news source either through subscription, donation or membership. Mobile is a big driver of reading local news online. Just over half (51%) of those surveyed consume local news on mobile devices, 27% on desktop/laptop, and 19% use both mobile and desktop. News alerts also factor highly into usage. Forty-two percent of consumers consume local news alerts on their mobile phones. Local news plays an important role in the community. Eighty-five percent report that it is important (very/somewhat) for local journalists to understand the history of the community. Eighty-one percent think it’s important (very/somewhat) for local journalists to be personally engaged in the community. In all, almost two-thirds of consumers (63%) report that local journalists are in touch with their community. However, far fewer (37%) feel that local journalists are influential in the community. Not surprisingly, people who view their local journalists as connected to the area give their local news media higher ratings than those who do not. The survey shows a key function of local journalism is to provide news to help local residents navigate their daily lives. Top news topics important to daily live include weather (70%), crime (44%), traffic (41%) and news about changing prices (37%). The majority of consumers report that their local media is doing well on the job. Seventy-one percent say local media is reporting the news accurately, providing “news that you use daily” (67%), “keeping an eye on local political leaders” (66%), and “reporting news thoroughly” (65%). Local news often tells the inside stories of communities. It plays a unique role ensuring news is relevant for a local audience. Importantly, innovation is in the works for local digital news. A number of industry initiatives are underway. Google recently announced their Local Experiments Project, a new partnership with McClatchy to fund the creation of three local digital-only, multi-platform publications. Facebook is also investing $300 million in journalism projects including a non-profit venture that focuses exclusively on local reporting. In each of these initiatives, publishers are part of the digital transformation of local news to ensure the presence of community engagement. Numerous privacy scandals fueled the need for increased examination of tech companies’ data tracking practices. For years now, the practice of data collection, data mining techniques and practices and the potential violations of consumer privacy have been questioned. However, it wasn’t until the Facebook and the Cambridge Analytica scandal that consumers realized the value of their personal data. Cambridge Analytica was by no means an isolated case. Last summer, an Associated Press investigation found that Google’s location tracking is never really disabled. Tracking continued, even if you turn it off in a number of Google apps, including Maps, Search, and others. Further, research from Professor Douglas Schmidt of Vanderbilt University found that Google engaged in “passive” data-collection often without the user’s knowledge. His study also showed that Google utilized data collected from other sources to de-anonymize user data. This is why DCN wrote this column, “It isn’t just about Facebook, it’s about Google, too” in the Washington Post when Facebook first faced Capitol Hill. It’s also why the description, Surveillance Advertising, has now stuck to describe Google and Facebook’s businesses. With consumers on alert, news of Google’s violation of personal data practices are not fading. Understanding that trust is a result of delivering on expectations, DCN surveyed a nationally-representative sample* to find out just exactly what people expect from Google. As with a similar study we conducted last year that measured consumer expectations of Facebook, the results were unsettling. Google uses personal data to tailor and micro-target ads, from which most of its $135 billion revenue comes. Unfortunately, our findings show that many of Google’s data practices deviate from consumer expectations. We recognize and find it even more significant that expectations are likely at an all-time low after the year that was 2018. 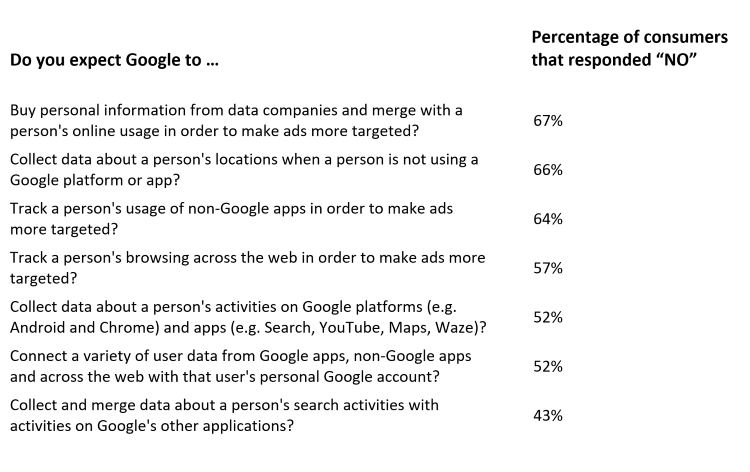 Google’s personal data collection practices affects more than two billion consumers who use devices that run Google’s Android operating software and hundreds of millions more of iPhone users who rely on Google for maps or search. Most of them expect Google to collect some data about them in exchange for use of services. However, as our research shows, an alarming number of consumers are unaware that Google tracks their activities across the web on other sites and platforms, even when they turn off the tracking defaults. With new laws in Europe, California and federal discussion about how to bring similar protections to the rest of America, it’s critical to understand what consumers actually demand, align expectations to those demands and rebuild trust in our industry. The public shouldn’t expect anything less. *ORC International Online CARAVAN®, 1004 Adults 18+, March 21-24, 2019. Cord-cutters are having a transformative effect on the entire video advertising ecosystem. As viewers enthusiastically embrace connected television (CTV) advertisers are following suit. They have accelerated their CTV investments in order to engage consumers at every digital touchpoint in a video everywhere world. In addition, the impact of CTV growth is reverberating across destinations and devices, with premium publishers benefiting from its growth, and mobile moving into second place in terms of percentage of overall impressions by device. These are some of the biggest takeaways from our Q4 and Full-year 2018 Video Benchmark Report from Extreme Reach, which provides a cloud-based creative asset management platform, AdBridgeTM, tailored to the needs of the ad industry. Based on the latest aggregate performance data from ER’s proprietary video ad server, the latest benchmarks report reveals emerging ad performance trends as indicated by such metrics as viewer click-through, video ad completion and viewability rates, as well as invalid traffic and time spent. 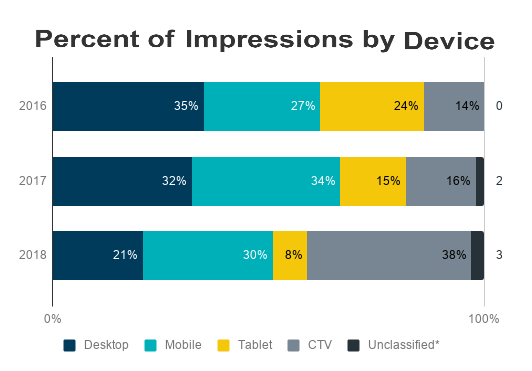 The report also provides breakdowns related to these numbers based on media destination (i.e., premium publisher vs. media aggregator) and device (i.e., desktop, mobile, tablet and connected television [CTV]). Here’s what we found in 2018 that’s likely to gain force in the years ahead. According to market research firm eMarketer, CTV use has soared to about 190 million users as consumers seek out new or additional ways to view TV content on their terms and timelines. That means more than half (57%) of the population has migrated from linear TV to devices like Roku and Apple TV, as well as ad-supported streaming services. Advertiser uptake has not been as robust as that of consumers. eMarketer says CTV represents only a small piece of overall digital ad spending today. However, the spend is enough to shake up the share of impressions being earned across devices and destinations. For example, mobile dominated video ad impressions in 2017, peaking with a 39% share in Q4 vs CTV’s 16%. But in a year’s time, that number had grown to 44% of impressions. That represents a stunning 193% increase. On the other side of the coin, the share of impressions served to desktops and tablets has continued to shrink every quarter since Q1 2016. More specifically, we saw declines from Q4 2017 to Q4 2018 of 36% and 54%, respectively, for desktop and tablets. As viewers gravitate to CTV, premium publishers are moving there too. In Q4 2018, more than half the impressions served by Extreme Reach to premium publishers ran on CTV platforms, an increase of 154% from the 21% that ran on CTV in Q4 2017. CTV is having a halo effect on other metrics important to advertisers including ad length, levels of invalid traffic and video completion rates on premium sites. Regarding ad length, 6-second ads seemed to be positioned to be the next wave, given their performance in the first two quarters of 2018 and all the media coverage they earned at that time. 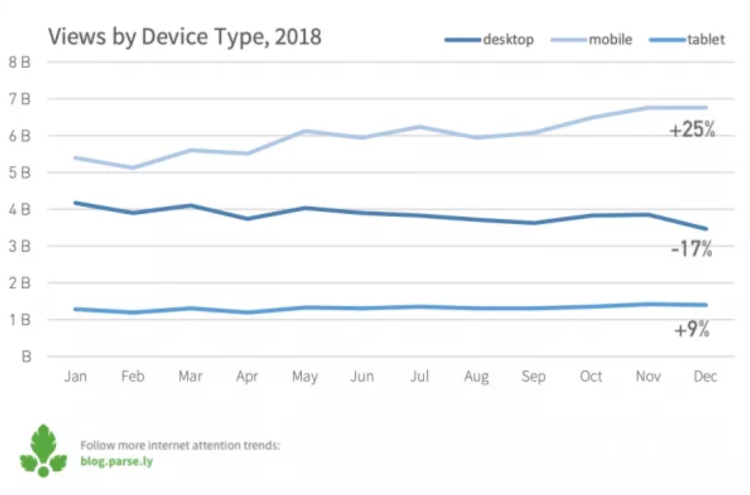 But the declines in mobile and desktop consumption drove a 78% decrease in impressions for 6-second spots from Q4 2017 to Q4 2018. Instead, as first noted in Q3, the rise in CTV seems to be causing a resurgence of longer ads, with 30-second spots increasing their proportion of impressions and more than doubling from Q4 2017 (28%) to Q4 2018 (58%). However, 15-second spots, which held the majority of impressions throughout 2017, declined by 43% from Q4 2017 to Q4 2018. It’s not surprising then that with 30-second ads taking the lion’s share of impressions last year, the average time spent with video ads increased by 35.3%, from a low of 17-seconds in Q4 2017 to 23-seconds in Q4 2018. For advertisers, directly-bought CTV remains relatively insulated from non-human traffic. This provides marketers with the brand-safe environment they are increasingly demanding. Video completion rates are also very high on CTV, likely a reflection of the level of commitment consumers bring to content on the channel, as well as the inability to skip the ads. While video completion rates are up for all devices, CTV is the winner in the category with 95% of ads playing all the way through. Premium vendors, who charge premium prices, are investing in CTV and providing the performance advertisers expect. So what do the 2018 metrics mean for the future? Given how quickly and dramatically video advertising has moved from a mobile to a CTV focus it’s difficult to predict how much more change CTV will bring in the year ahead. But with audiences so focused on CTV, it’s reasonable to assume that more major media companies will enter the CTV market via new launches, partnerships and acquisitions, making the market even more competitive. But overall, these developments seem to bode well for both viewers and advertisers alike. Visit Extreme Reach’s interactive video benchmarks report to review complete findings for Q4 and the full year. Innovation is the key driver of sustainability and financial viability. This is why successful publishers are developing and testing new products, offerings and revenue models. A new report, 50 Ways to Make Media Pay, by Professor Damian Radcliffe of Oregon University in partnership What’s New in Publishing, offers an overview of 50 different revenue opportunities. It’s a collection of strategies—from paywalls to advertising tools, events, and commerce. Some are new ideas while others are not. It’s the collection and the variety of the revenue diversification options and the links to publishers executing these strategies that make this report so valuable. Professor Radcliffe highlights the pivot to paywalls and a focus on reader revenue as a new norm. The New York Times, The Washington Post, The Financial Times, The Wall Street Journal, The New Yorker, and Bloomberg are some of those offering subscription products. Following its move to put Wired behind a metered paywall, Conde Nast has announced plans to follow suit with its other magazine brands. One thing that paywalls offer (in addition to recurring revenue) is the opportunity and flexibility of real time learning. Hard paywalls will not allow consumers access to content without a subscription. Both The Financial Times and The Wall Street Journal use hard paywalls. Metered paywalls allow users to read a set number of free articles before the user must pay the publisher (subscribe). Reducing the amount of content that audiences’ accesses for free is one way to try and drive consumers into paying for the content. Hybrid paywalls offer some free content to users while other sections are secure behind a hard or metered paywall. Vertical-only paywalls allow subscribers to pay for a standalone access to a vertical like sports, entertainment or food section. Geo-location paywalls use IP addresses to identify users’ locations. Different locations may have different paywall limitations. A local audience may have more access and free articles than a user outside the local (target) area. This type of audience identification is often attractive to advertisers targeting a local audience. Print and digital bundling began as a method to build digital subscribers. Originally, it offered loyal print subscribers, especially newspaper, a discount for digital access. Now, the tables are turned. In order to get the print product in front of more eyeballs, many offer free (or heavily discounted) print access to digital subscribers. Online surveys offer a trade-off of user information for free content. There’s a consumer willingly to answer questions about themselves for free access. User information is a valuable commodity, especially to advertisers. There’s also the pay-as-you-go strategy of micropayments. This approach enables readers to consume content one article at a time. Blendle, a journalism startup in the Netherlands, partners with many leading Dutch publishers to offer a micropayment plan. Memberships offer new opportunities for publishers. It’s particularly relevant to a mission driven publication. Memberships offer the newsroom a chance to build a closer relationship with its members (readers). Memberships often offer access to bonus content and special events. Slate Plus is successful using this membership model. Live events and recordings include big ticket interviews of industry or popular icons (e.g. Hillary and Bill Clinton and Michelle Obama). Popular radio show events offer consumers the chance to watch a taping of the show in a live studio setting. Two radio shows, This American Life and Radiolab, completed successful live tours across the U.S. Happy hours and socials are great vehicles to attract and build an engaged reader community. At these events, attendees have an opportunity to talk to journalists about a relevant and/or current topic. Events can be lucrative for small publishers too. Billy Penn, a Philadelphia based digital news outlet, reports that events constituted 80% of its revenue. Publishers need to evaluate the brand relevance and potential of each revenue strategy. What works for one publisher, may not work for another. Experimentation is key to learning the best approaches for publishers to monetizing their content and first party relationship with their audiences. Publishers are using voice technology, such as smart speakers (e.g. Alexa and Google Home), to create new connections with their audiences, particularly younger consumers. It’s also a great way to develop new revenue opportunities. According to the new INMA report, Audio Opportunities for News Media, publishers are building audio resources to allow dynamic content or ads insertion into voice-enabled devices. The report includes a number of market estimates of ownership and media usage. For example, according to the International Data Corporation, smart speaker adoption will grow worldwide from 99.8 million in 2018 to 230.5 million in 2022. INMA’s research also cites TMG Media, which reports that one-third (33%) of those owning an audio device, own more than one. Media habits of audio device owners show that 45% are listening to less radio, 38% are using their smartphones less, 32% are reading fewer magazines and newspapers and 29% are watching less TV. In addition, Edison Research and NPR found that 43 million Americans own a smart speaker. This audience is open to new media experiences. In fact, 81% of them are open to new smart speakers features created by brands. Twenty-two percent of these users also like brands that create skills/features on smart speakers, stronger than any brand activity on TV, radio, and podcasts. A few news publishers are building their audio assets internally or using third party on-demand audio platforms to distribute their new content to audiences (full detailed case studies in report). 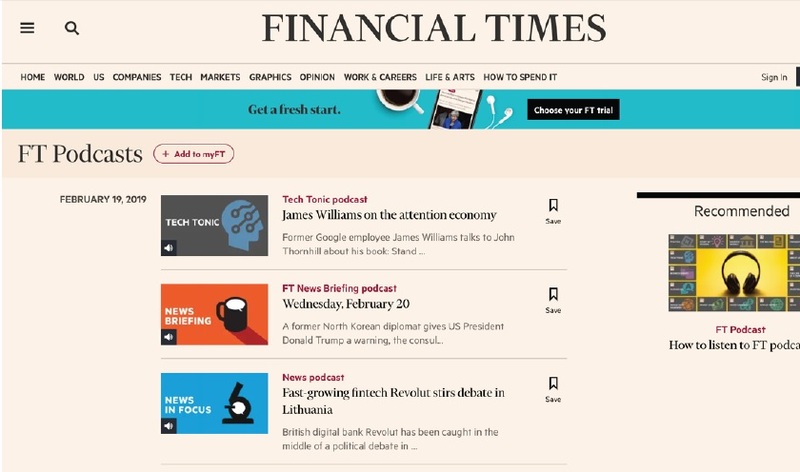 The Financial Times (FT) debuted its News Briefing, a daily news offering, optimized specifically for smart speakers. They also produced an interactive documentary, FT Hidden Cities Berlin, in partnership with Google and available exclusively on Google Home. FT estimates at least 60% of their listeners are non-subscribers to their print and/or digital products. FT views the usage of smart speakers as a new opportunity to experiment with content to grow subscribers. Further, smart speaker listeners are a younger audience, often a difficult segment for FT to target. Alastair Mackie, head of audio for commercial at the FT believes that creating content for the smart speaker allows FT to be innovative and engaging while present itself as a digital first’ media company. The New York Times’ T Brand Studio produces ad-sponsored and stand-alone podcasts. It launched The Daily, a 20-plus minute daily news podcast and radio show, in 2017. It’s widely popular and a strong advertising vehicle in the marketplace. New audio content in the works at The Times includes a daily flash briefing, an interactive news quiz, and enhanced coverage of its Sunday newspaper. Sebastian Tomich, global head of advertising and marketing solutions, thinks smart speakers offer a great opportunity to test audio content and learn about audience engagement while generating revenue. The Times is also investing in teaching consumers how to use audio commands with step-by-step instructions. Audio smart speakers are changing consumer habits and news media companies are beginning to invest in audio tech to produce on-demand audio content. They believe it offers great branding and marketing opportunities and can help generate additional advertising revenue. 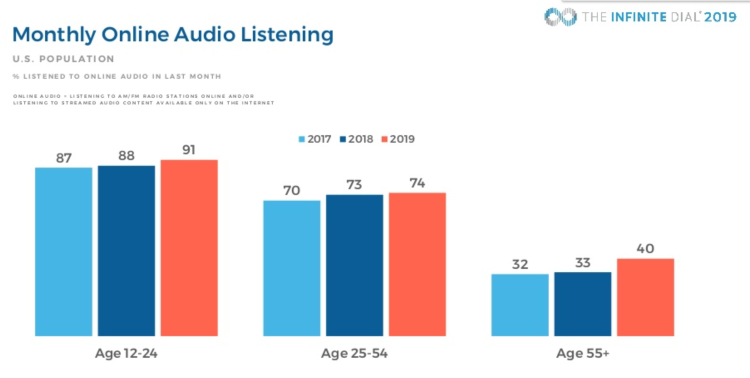 It’s a ripe time to invest in audio content as smart speaker owners are spending more time listening to on-demand news, music, podcasts, and books. Traffic to your most engaging content can come from unexpected places. 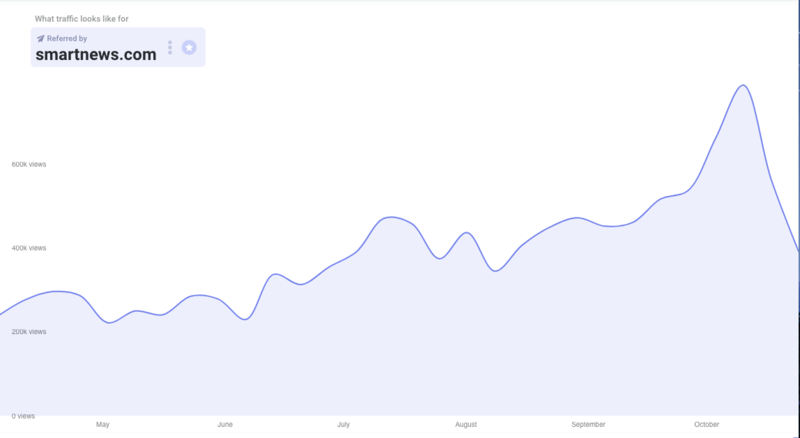 Case in point: Chartbeat’s data science team recently found that TopBuzz — a China-based news aggregation app — was responsible for a multi-million spike in pageviews among our publishers late last year. In December alone, TopBuzz referred almost 34 million pageviews across Chartbeat publishers throughout the world. That’s a 36x increase from January 2017. We also found that about half of the traffic referred by this app comes from the U.S. However, we are increasingly seeing a significant share from countries such as Brazil, France, Germany, Italy, and the UK. This traffic spike piqued interest among our partners and, in turn, Chartbeat’s data science team. Therefore, we thought it would be worthwhile to take a deeper dive into this referrer with significant potential to drive engaged readers to publishers. So what is TopBuzz and, more importantly, why is it driving so many pageviews to publishers? TopBuzz is one of several digital properties owned by ByteDance, a Chinese startup reportedly valued at $30 billion. ByteDance had already made its mark in the media landscape with well-known news aggregator app TouTiao, which aptly translates to “HeadLines”. To date, TouTiao was thought to be the primary source of referral traffic to our publishers. In Android land, TopBuzz sits at number 11 in the free News & Magazines apps on the Android Play Store (as of the time of writing). It’s also ranked 16 in News on the Apple App Store. How is Chartbeat accounting for this finding? We’ll also surface traffic from other apps owned by ByteDance, which will appear as “News Republic”, “BuzzVideo”, and “Buzz Up!” referrers. This should resolve any confusion surrounding the source of this traffic previously classified as TouTiao, as you see in the image above. Our data science team will continue analyzing TopBuzz to get a better sense of its long-term impact on referral traffic to publishers around the world. In the meantime, the more accurate referrer classification is intended to better inform your global audience development strategy. This is similar to knowing traffic is actually coming from “Google News” rather than just “Google”. An increased familiarity with TopBuzz will give you an opportunity for more internal discussions on how to proactively place your most engaging content front and center for this referral source. While TopBuzz may be largely unknown in the U.S., TouTiao has been massively popular abroad. As an article in TechNode notes, ByteDance’s core competency is its AI-based system for content creation, curation, and dissemination, which forms the architecture behind all of its apps. This can incentivize content creators through financial rewards often based on clicks, curating content according to the preferences of each individual reader. However, this may come into conflict publishers’ efforts to resist click-centric content. Therefore, be sure to assess your long-term audience development goals before exclusively tailoring content for TopBuzz. Take a lesson from our TopBuzz discovery—we’re in a global media landscape. Couple that with our increasing app usage, and there are potential revenue opportunities for publishers all over the world. This means that even if optimizing content for TopBuzz isn’t right for you, there are and will be many more opportunities to offer engaging content to new, diverse audiences. And don’t worry, we’re keeping a close eye on new sources of referral traffic every day to make sure you get a heads up. Su Hang of Chartbeat’s Data Science team contributed research to this article. 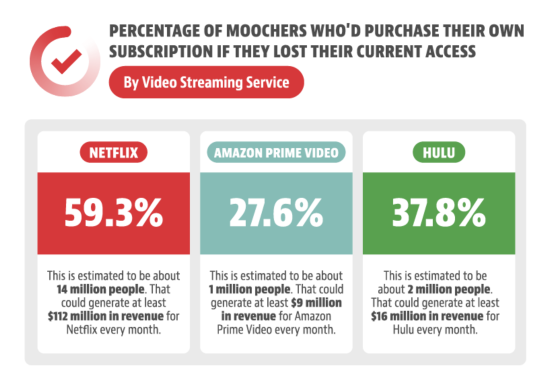 Subscription mooching is a common practice in today’s streaming ecosystem where people borrow subscribers’ logins to access services like Netflix and Hulu rather than paying for them. To understand the magnitude of password sharing, the website, Cordcutting.com conducted a survey of over 1,000 people ages 18 to 81 to examine who is really paying for streaming subscription services. The new report, Subscription Mooching, shows that nearly 20% of users of the major streaming services are borrowing logins from subscribers. According to the research, 19% of Hulu viewers use someone else’s login, as do 17% of Amazon Prime Video viewers, and 15% of Netflix viewers. Not surprisingly, parents are the most frequent source of shared passwords for Netflix and Amazon Prime (32% each, respectively) while significant others are the main source of password sharing for Hulu (26%). The television landscape is changing with only 7% of viewers subscribing to cable TV and 30% subscribing exclusively to video streaming services for their media consumption. 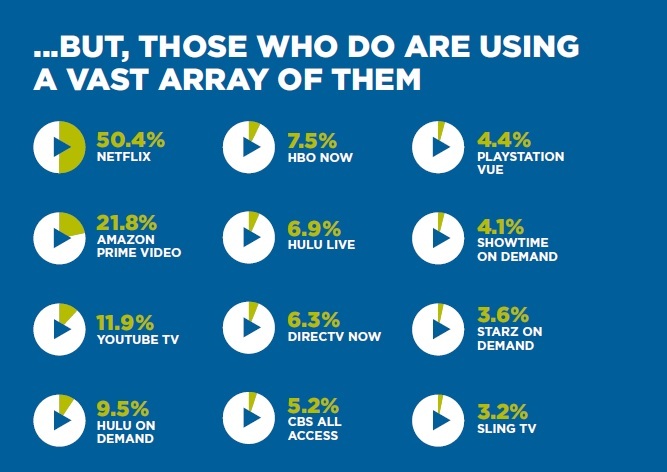 In total, approximately 68% of people use cable TV and 92% use a video streaming service. Of course, many streaming services allow simultaneous streaming on multiple devices. However, each treats the sharing of account credentials differently. The amount that moochers avoid paying varies. On average, people borrow a Netflix subscription login for 26 months. At the lowest subscription plan price of $7.99 a month, a person can save $207. Interestingly, a login is borrowed for Amazon Prime Video for approximately 16 months, saving on average $144. A login borrowed for Hulu is used the shortest amount of time, approximately 11 months, saving an individual $88. While sharing an account login can provide a consumer savings, it comes at a substantial loss for the streaming services. The research uses the difference between the total number of subscribers and the total number of users in order to project the potential revenue loss. According to this report, Netflix is losing approximately $192 million every month or $2.3 billion a year. Hulu and Amazon Prime Video average between $40 and $45 million in estimated losses each month or approximately $0.5 million per year, respectively. Trial usage appears to be a good source of conversion. Approximately 59% of people are willing to pay for their own Netflix subscription if they are no longer able to access a shared login. While significantly less than Netflix, 38% of Hulu and 28% of Amazon Prime users are willing to subscribe if they are no long able to access a borrowed login. Login sharing does offer some retention value. It’s hard for consumers to cancel their subscription if they know others are relying on them for access. Marketing and retention factors aside, streaming services need to address password sharing in order to grow their market share, especially among millennial and generation X audiences. Today’s consumers navigate a high-choice multiplatform environment to find their news content. Understanding their news consumption habits – what’s relevant to them, and why they read what they do – is a complex process. However, while data rankings show which stories are clicked on, shared, and liked the most, there’s little information about why consumers choose to read the content they do. Kim Christian Schrøder’s new report from The Reuters Institute for the Study of Journalism, What do News Readers Really Want to Read about?, delves into the process by which consumers choose the news the consume. The research evaluates the ways in which people are drawn to news, how it helps them make sense of their lives, and shapes their views of the world. Relevance is a key driver in consumer decision-making on news content. Ultimately, perceived relevance determines whether consumers end up engaging with a particular news story. 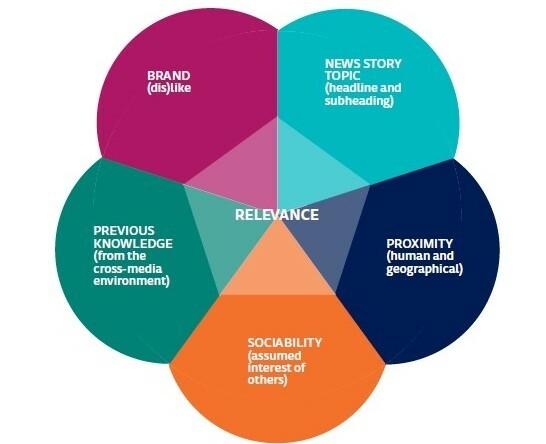 The factors that drive and define news relevance. Understanding the role of relevance helps explain why important news stories may not always rank according to national interest. Article rankings are often algorithmically charged by the number of “likes” and “shares.” While social indicators often increase visibility, they are not necessarily reliable factors of relatability and quality content. In addition to identifying relevance as an important driver, the research also classifies four distinct clusters of news readers according to news preference. People with political and civic interest in news. This segment is mainly interested in stories about health, education, and the environment. People with a social-humanitarian interest in news. This cluster like stories with a humanitarian perspective on the world. They also gravitate to news reports on soft politics (e.g. Britain’s royal family). People with a cultural interest in news. This segment values news stories about children, health, educational issues, and environmental protection. However, they dismiss clickbait articles designed to lure them into reading human-interest and celebrity focused stories. People who seek (political) depth stories. This segment likes their news from a mixture of general and more specialized news sources. They are big readers and selective in their news sources. Schrøder provides insight into what drives audience choice when it comes to news consumption. Understanding relevance and its impact on how readers build their personal media selection is an important step in identifying consumers’ news preference. Further, the identification of consumer news clusters offers four distinct reader groups of content preference without imposing the standard news categories. Both set of findings heighten our understanding of how consumers select their news content. This past month, we took an in-depth look at the referral platforms sending the most traffic to our network. We looked at the rate of their growth in 2018, the word count and device type for each, and the specific categories of content that attract readers, both in total volume and pageviews per post. We’ve got loads of data, which you are welcome to dig into. But here are five key highlights from the 50+ graphs, 5000 words, two posts, and a PDF we created out of the data report we produced. 1. Consistent growth on Flipboard and SmartNews for 18+ months. Non-social and non-search traffic referrers grew (in terms of percentage) the most in 2018, 21%, you can see the breakdown for each below. Specifically, a lot of people didn’t realize that SmartNews and Flipboard have been growing for a while. Sure, their volumes still don’t warrant the attention that Facebook or Google gets. However, their steady growth numbers still surprised a lot of people who saw our data. For anyone that wants to learn more about these two platforms: Axios covered more about SmartNews, and Digiday looked at Flipboard’s user growth. Figuring out if that’s an audience that works, and how to work with them should at least be on the short list of considerations for audience teams in 2019. Twitter didn’t grow in terms of referrals in 2018, but does that mean it’s not important? Just because we see a platform go down in one metric doesn’t mean it should get written off. 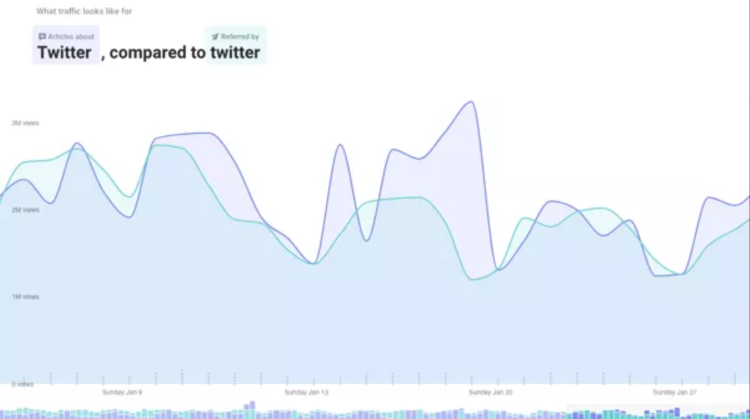 One example of why was this data stat: More views go to articles that include Twitter as a topic than views that are actually referred by Twitter. The relationship between media and Twitter is clearly more complicated than a simple “how much traffic are we getting” question. 3. Pinterest gets the highest percentage of its referrals to short (<200 word) posts. SmartNews and Facebook also both send more shorter posts than is average on our network. LinkedIn sends the highest percentage of its traffic to long from (>1000 word posts), as does the Drudge Report. This data itself doesn’t say much about whether people stay and read those long form pieces, but it does indicate what people want to share on those platforms and the mindset they’re in. Well, this one isn’t exactly a surprise, but it is worth noting that the trend hasn’t stopped. Speaking of mobile, AMP is everywhere. AND finally, 48% of mobile referrals from Twitter. 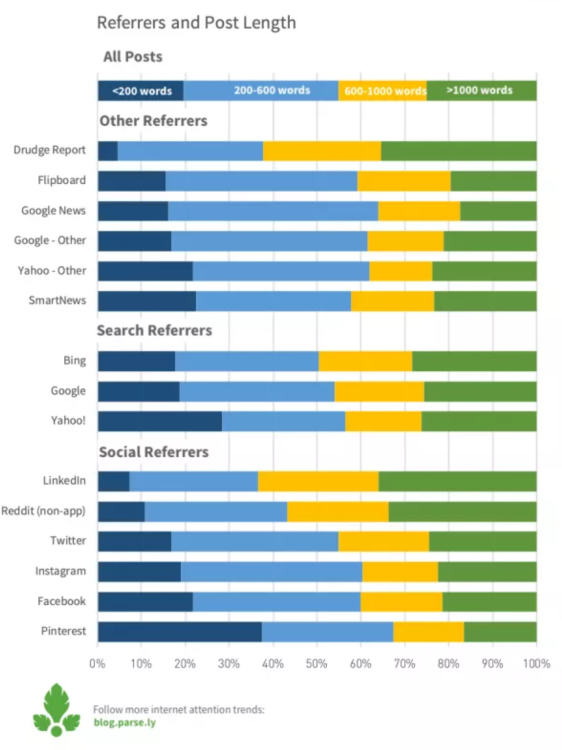 The full report on these referral data trends and more can be found on the Parse.ly blog. With new OTT video services popping up daily, there’s fierce competition in the marketplace. 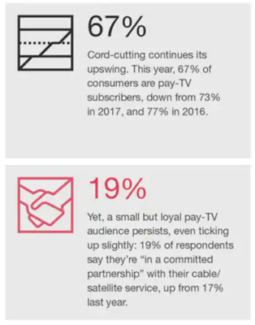 Cord-cutting continues in the U.S. with just over two-thirds of consumers (67%) reporting pay-TV subscriptions, down from 73% in 2017, and 77% in 2016. 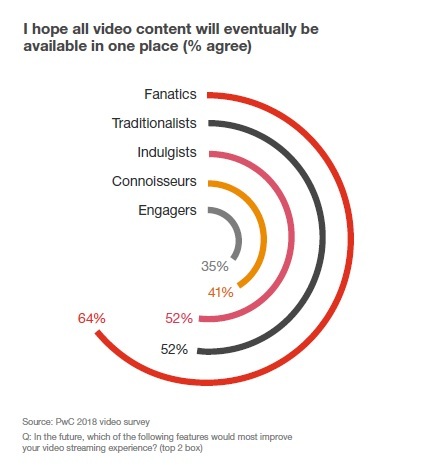 PwC’s new report, A new video world order, studies consumers’ relationship with video content to develop five new motivation-based consumer profiles. In this competitive market, it is critical for content services to maintain strong viewer relationships, which start with understanding. Indulgists are consumers driven by consumption, be it video, technology, or just stuff. The indulgists is always looking for the latest gadget, premium service, and original content to purchase. They watch approximately 17 hours of content a week and at least 35% spend $100 or more on video content a month. The average age of indulgists is 37. Importantly, they are committed to their pay-TV relationship and see themselves as subscribers five years from now. Engagers are totally immersed in the content they view. Their average age is 34 and they consume approximately 12 hours of content a week. Seventeen percent of engagers spend $100 or more on monthly video entertainment. This segment wants to engage with video content and they like to post about the shows they are watch on social media. They are also more likely to be gamers. Engagers look forward to virtual reality intersecting with TV series for a personalized storyline experience. Fanatics, whose average age is 34, are willing to do anything to access content. They consume about 16 hours of video content each week and 20% spend $100 or more on video entertainment a month. This segment wants to access endless content, especially all in one place. They’re likely to be cord-cutters who now subscribe to multiple services. Fanatics can often be found binge watching. Connoisseurs tend to be more educated and are culturally focused when it comes to their video content. Their average age is 39 and they spend about 10 hours a week viewing video content. Eighteen% of connoisseurs spend $100 or more on video content a month. While they like television, they prefer to read. This segment is also more likely to be comprised of cord-trimmers than cutters. Traditionalists are overwhelmed by content choice and find comfort in watching live-TV. Their average age is 40 and they consume approximately 15 hours of content a week. Thirty-two percent of traditionalists spend $100 or more on video content a month. This segment tends to be older and often has TV on in the background. It’s used for both comfort and company. Traditionalists are more likely to use pay-TV to access content compared to going online or accessing an apps. PwC mentions two areas of focus to increase consumer engagement: 1) better content recommendations and 2) a central access point for content and payment. Consumers report that recommendation algorithms are often reactive and recommend the same content over and over again. Thirty-six percent of consumers also report that finding content on streaming platforms needs to be easier. Further, consumers want to consolidate their content and payment into one place (51 and 50%, respectively). PwC emphasizes the importance of maximizing the user experience to develop a competitive advantage in a very crowded video marketplace. Providers should understand the audience’s motivation for content. It helps to drive engagement. Content is not a one size fits all experience and it’s essential to build a positive consumer encounter at each step in the process. Artificial intelligence (AI) is part of today’s decision-making process. It’s used when companies identify the value and risk of issuing credit cards or forecasting unemployment benefits. It’s also used in employee recruitment and the college admissions process. Since AI is based on machine learning, each small decision impacts larger ones. Unfortunately, AI algorithms, especially among those conducted in black boxes, may include discriminatory practices. A biased outcome may not necessarily be the intent of the algorithm, but it can easily be a by-product. Frederik Zuiderveen Borgesius, Professor of Law at the Institute for Computing and Information Sciences (iCIS), Radboud University Nijmegen, addresses issues of AI bias in his new report Discrimination, artificial intelligence, and algorithmic decision-making. Borgesius analyzes the AI process to better understand how unfair differentiation can be produced. He wrote this report specifically for the Anti-discrimination department of the Council of Europe. However, it is an important read for anyone involved in or thinking of using AI in decision-making. It’s important to first understand the basics of an AI decision-making program. AI involves machine-learning to find correlations in data sets. It uses algorithms to identify the relationships in a set of related attributes or activities, also known as class labels. The class labels separate all possibilities into mutually exclusive categories. When building a machine learning tool, programmers use class labels to predict a derived outcome or what is called the targeted variable. To understand how this is works in a common application, think of a spam filter. The spam filter is an AI program that sorts through email messages and identifies those that are “spam” and “non-spam.” The program uses archives of older emails labeled as spam or non-spam to help identify the characteristics (a certain phrase, an email address or an IP address) of each. Professor Borgesius references the work of Solon Barocas and Andrew D. Selbst, two academic research experts, who identify five ways in which the AI decision-making process can lead unintentionally to discrimination. When defining target variables and class labels, it’s important to think beyond how they are defined. For example, let’s say a company wants to define an “engaged employee.” A variable assigned to an engaged employee is someone who is never late for work. Unfortunately, this could negatively impact employees who do not own a car and depend on public transportation. Car ownership can also reflect higher income while reliance on public transportation can connote lower income. Therefore, this class label of never being late creates a bias against lower income employees. Mindfulness in the usage and creation of class labels is important to prevent built-in biases. AI decision-making also offers discriminatory results if the system “learns” from discriminatory training data. All training data should be scrutinized to ensure against biases. For example, a medical school decided to use AI decision-making in its application process. The training data for the programs included old admission files from 1980. Unfortunately, the acceptance policy in the 1980s was heavily weighted against women and immigrants. While the AI program was not introducing new biases, it included those inherent in the admissions process of the older applications. The sampling process of the data collection must be free of biases. If the sampling process is biased, it will train the predictive models and reproduce the biases. For example, the number of police officers sent to patrol a neighborhood is often dependent on key variables such as neighborhood size or density, etc. If a larger number of officers patrol a neighborhood and report a high level of crime, we need to understand the factors involved. Otherwise, the data amplifies a high crime rate in this neighborhood when it could be that was a higher ratio of officers to see more crimes in progress. A programmer selects the categories or features of data to include in their AI system. By selecting certain features, a programmer may introduce bias against certain groups. For example, many companies in the U.S. hire employees who graduated from an ivy league university. An ivy league education cost significantly more than a state university. If a company uses ivy league universities as part of their data features, they are establishing a bias against individuals of lower income. Data features must be fully accessed to ensure characteristics do not introduce bias in the results. Sometimes measures to make a relevant and well-informed decision may lend themselves to a biasness. Zip codes are often used as a neutral criterion to provide socio-economic information for decisions on loans, credit cards, insurance, etc. However, if a zip code is used as proxy to identify people of a specific race or gender, it will impact business results. Importantly, transparency of AI systems and the decision-making process is necessary. Borgesius, as well as other academic scholars, advocate for the development of transparency enhancing technologies (TETs) to drive meaningful transparency of the algorithmic processes. AI decision-making can result in negative consequences for people, especially protected member classes. Caution must be used in algorithmic decision-making to ensure AI does not pave the way for discrimination. DCN recently released insights from the DCN Direct Audience Revenue Case Studies Report conducted in partnership with The Lenfest Institute. This media strategy research, exclusively for DCN members, offers actual publisher lessons and case studies in building subscriptions and memberships for digital publishers. Build a digital marketing team whose primary focus is to increase digital subscribers. Test price increases on tenured subscribers, balancing the risk of some increased churn with the greater revenue yield that comes with a higher subscription price. Create bonus content and experiences (such as behind-the-scenes, extended interviews, etc.) that offer your readers extra value and bring them into the process and culture of your organization. Measure, test, and experiment to understand what kind of content deeply engages your members — and segment your audience based on engagement levels. DCN is uniquely positioned to provide insights into how publishers are building diversified revenue strategies. *If you are interested in learning more about this report and other DCN research, please contact Rande Price, DCN’s Director of Research. Americans are spending more time than ever viewing content, be it paid or free, from linear TV to streaming video devices. According to the new TIVO Video Report, based on Q4 2018, the average household now uses 2.75 services, a 26% increase in service usage compared to the same time last year. The TIVO Video Report interviewed close to 4,500 adults 18+ in the U.S. and Canada. TV viewers subscribe to multiple services in order to watch the content they want, when they want it. Top consumer bundles include subscriptions to Netflix, Prime Video and Pay-TV (10%), Facebook, YouTube and Pay-TV and YouTube, Netflix and Pay-TV (both 8% each). With marketplace fragmentation continuing, the question remains, how long will consumers maintain subscriptions to multiple services? More than half of the respondents (53%) report Netflix as an essential entertainment source, followed by free YouTube (46%), and cable-TV (40%). 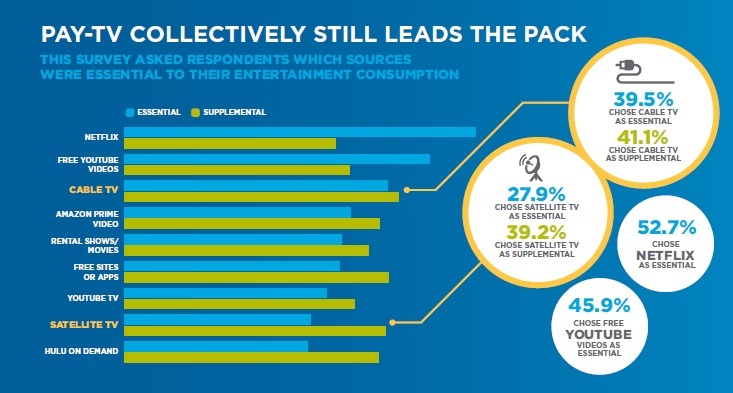 Interestingly, just over 40% of consumers also report cable-TV as supplemental to their entertainment sources, suggesting consumers are equally as committed to cable TV as they are non-committed. The distinction consumers make between essential entertainment services and supplemental is an important one. It will eventually determine the services consumers keep and which they cancel. While Netflix may hold the largest audience share as an essential entertainment source, Live TV dominates total viewing time (self-reported). Close to two-thirds of respondents’ report (65%) watching one hour or more of Live-TV per day, 52% watch one hour or more of OTT/Subscriptions services per day, 51% watch recorded content (e.g. DVR) and 46% watch one hour or more of live sporting events (which may factor into the 65% Live-TV viewing). Free video content is also popular with nearly one-third of respondents (31%) reporting use of a free video service. Top free video services include YouTube (58%), Facebook (44%), Twitch and Pluto TV, each rounding to 18%. Interestingly, network TV mobile apps show limited appeal. Nearly 60% of respondents do not use any TV network apps. Of those using a TV network app on mobile, the top downloaded include: ABC (10%), A&E (9%), CNN (8%), Cartoon Network (8%), and CBC (7%). In addition, more than one-fifth of respondents (22%) access Pay-TV via a streaming device. In fact, 26% report replacing their set-top-box (STB) with a streaming device. The top five streaming devices include a smart TV (27%), gaming console (19%), Roku (18%), Amazon Fire Stick (16%), and Apple TV (13%). Breaking up cable TV packages and going a la carte is an option for consumers. However, with so many programming and device choices today, the a la carte option is losing favor with only 71% of respondents stating interest compared to 81% in 2017. Further a full 29% of respondents are no longer interested in the a la carte option at all. The TIVO Report clearly shows that consumers have numerous choices when it comes to content, services and devices. Too many options can leave consumers overwhelmed, while too few options can lead to low levels of satisfaction. Industry players need to help consumers discover valued-content and a positive user experience to continue building consumer satisfaction and engagement. Consumer trust is a vital and a key differentiator for publishers in a competitive environment. Fostering trust, prioritizing consumer rights and offering transparency of data practices is more important than ever before for premium publishers. Significantly, according to the 19th Annual Edelman Trust Barometer 2019, consumer trust in traditional media (64%) and search (66%) are at highest ever historical levels. In contrast, trust in social media remains low, at 44%. Contributing to social media’s low trust scores is data showing that close to three-quarters (73%) of all respondents worry about false information or fake news being used as a weapon. The US and Canada and European markets also registered significant trust in traditional media and search compared to social media. 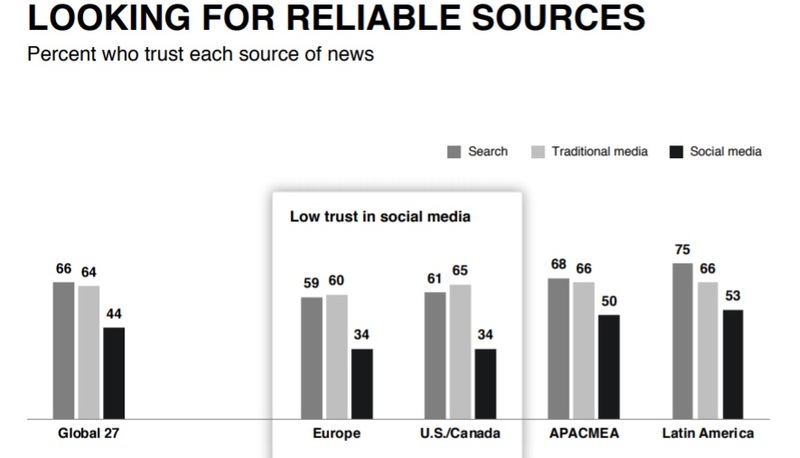 Trust in traditional media is at its highest-ever historical level at 65% in US and Canada and 60% in Europe, trust in search at 61% and 59%, respectively. However, rust in social media in both markets is at 34%. The percentage gap between trust in traditional and social media is now at an all-time high of 31-points in US and Canada and a 26-point gap in Europe. In terms of political differences, consumers who identify as Republican voters show only 33% trust in media compared to 69% of Democrats voters. Further, more women, think that the #metoo movement, (plus 23 percentage points year-over-year) than men (plus 18 percentage points) shift from the “mass population” to the “informed public” segment. People are also looking to leaders to take charge and initiate change. More than three-quarters (76%) of respondents report that CEOs should take the lead on change rather than waiting for government to impose it. Specific needs for positive change include: equal pay (65%), prejudice and discrimination (64%), training for jobs of tomorrow (64%), environment (56%), personal data (55%), sexual harassment (47%) and fake news (37%). In all, this year’s findings speak to a new sense of consumer engagement compared to last year’s Trust Barometer. This year, people seek new opportunities to find news and information to take better control of their lives. Publishers are challenged by the dominance of platform intermediaries in content distribution and advertising revenue. Those facing these challenges are looking to offset losses by broadening their revenue diversification through subscriptions and new product offerings. In fact, according to Reuters Institute’s Digital News Report: Journalism, Media, and Technology Trends and Predictions 2019, subscription and membership offerings are a priority this year. 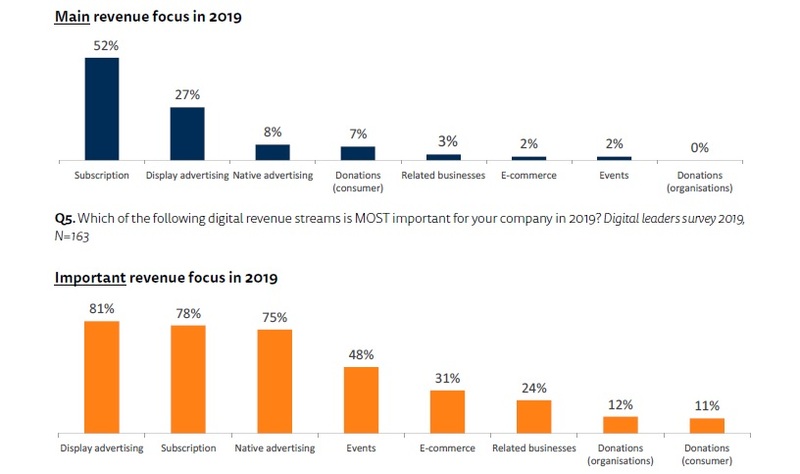 The report, based on responses from 200 editors, CEOs, and digital leaders from 29 countries, states that more than half (52%) of digital leaders expect subscriptions to be a main revenue focus this year. This compares to just over a quarter (27%) who cite display advertising as a main revenue source, and only 8% who state native advertising and 7% who report donations. Still, advertising is an important focus. A strong majority see display advertising (81%), subscriptions (78%) and native advertising (75%) as “important or very important” for company revenue. Limited funding for quality news. Less than one-third (29%) of digital leaders expect funding from foundations and non-profits. Eighteen percent expect contributions from tech platforms and 11% think governments will provide more support. A full 29% of publishers do not expect any assistance in funding. Google is very important; Facebook and YouTube less so. Google remains a key priority for most with most publishers (87%). They report it as “very or extremely important” compared to Facebook (43%), Apple (43%) or YouTube (42%) as they look to reach new audiences. Fewer publishers see Instagram (31%), Twitter (29%), WhatsApp (16%), Amazon (16%) or Snapchat (8%) as important to their news organizations. Social media presents options for marketing and acquisitions. Publishers that are focusin on subscriptions use social media more as a marketing and acquisition channel. Still, social media usage and results differ by publisher. 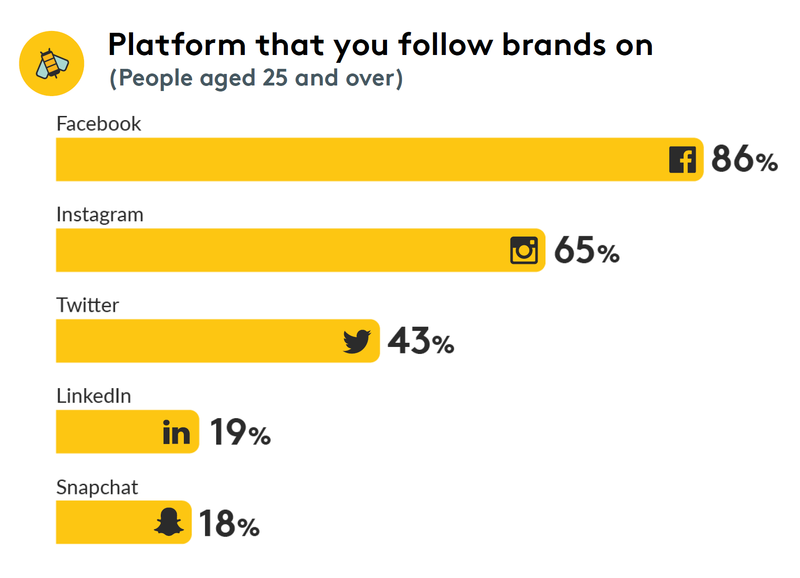 Magazine brands are more likely to use Instagram and Snapchat for marketing, while local news publishers use broad reach platforms for referrals. Publishers use visual storytelling to attract a younger audience. Stories has become a highly popular storytelling format. It is used daily by 150 million people on Facebook, 190 million on Snapchat, and 300 million on Instagram. Publishers are utilizing visual storytelling because it works well on mobile and helps attract a younger audience. Podcasts and voice assistant devices become part of publishers’ strategies. Three-quarters of publishers (75%) think that audio devices like Amazon Alexa and Google Assistant will become an important part of their content and commercial strategies. Seventy-eight percent also report that voice assisted devices will impact how audiences access content in the next few years. 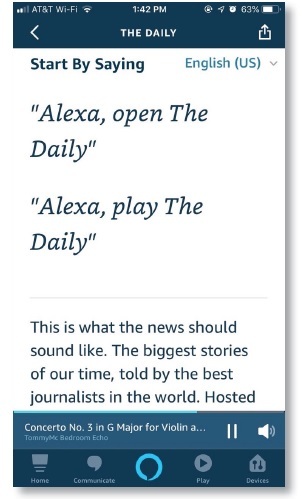 The New York Times now offers a short news briefing for Alexa devices and consumers can ask for the Times’ Flash News Briefing. Publisher paywalls may lead to consumer frustration. The strategy to put whole-publisher sites behind a paywall may meet with consumer backlash. If this occurs, publishers will likely see an increase in the adoption of subscription blockers, an easy downloadable software or browser extension with a workaround for metered paywalls. Increasing bundled offerings and payment aggregation. To prevent churn and increase engagement, publishers will announce bundled packages including more product and cross-media packages. For example, The Times of London offers a one-year Wall Street Journal subscription. Publishers, Telcom, and over-the-top services (OTT) are also packaging their services in subscription offerings. It’s essential for publishers to continue strengthening their relationship with consumers. Rasmus Kleis Nielsen, director the Reuter’s Institutes, comments in the Nieman Lab Predictions for 2019, “The shift thus has to be about better and more distinct journalism in an incredibly competitive battle for attention, about a greater focus on what readers actually value, about organizations and technologies built around serving them efficiently, and perhaps most importantly about a commitment to the long haul — to making the changes necessary to winning paying readers one at a time, keeping them, accumulating them.” Nielsen believes that in order to ensure journalism is valued, publishers must identify the needs of the reader. Importantly, there are new strategies and technologies available to build consumer value, heighten product attraction and increase engage with paying consumers. The Consumer Electronic Show (CES), hosted by the Consumer Technology Association (CTA), kicked off this week. The tech extravaganza, which showcases the newest innovation in artificial intelligence, augmented and virtual reality, smart homes, smart gadgets and other futuristic devices, kicked off with confidence in the sector. 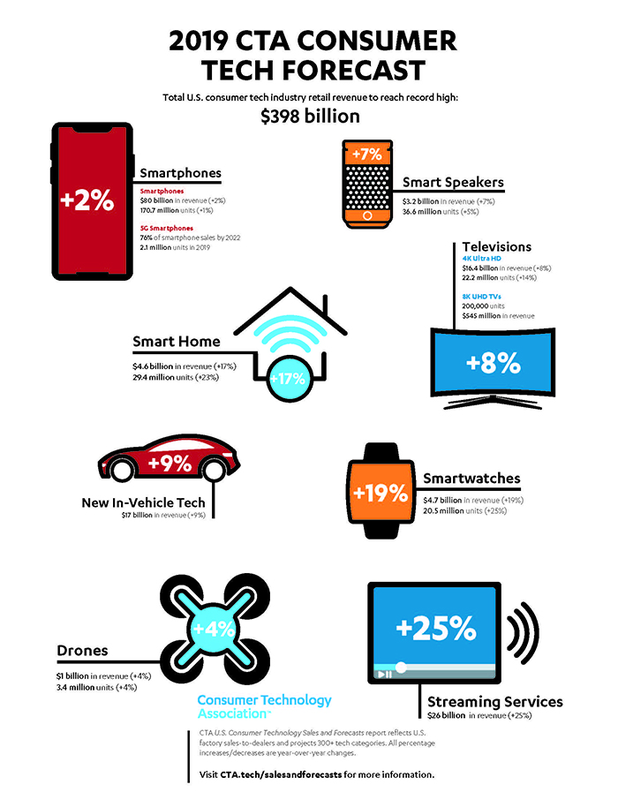 According to the CTA’s new report, the U.S. consumer technology industry is expected to reach $398 billion in retail revenues this year, registering a modest 3.9% growth year-over-year or about $15 billion. Still, CTA recognizes that revenues may be hurt by trade friction between the U.S. and China. The CTA’s bi-annual report provides a benchmark for the U.S. consumer tech industry. Overall, the key drivers for revenue growth include Smartphones, laptops, and televisions. Smartphone revenue is expected to reach $80 billion (2% growth year-over-year). Importantly, by 2022, three-quarters (76 percent) of all smartphones sold will be 5G-enabled. Laptop revenue is projected to reach $28.4 billion (flat compared to 2018) and television revenues should increase 2% year-over-year, reaching $22.6 billion. Further, factory install in-vehicle technology is expected to reach $17 billion (9% increase year-over-year). Top consumer requests include driver-assist features such as active collision avoidance and lane keep assist. Smart speakers including Amazon Echo and Google Home are projected to earn $3.2 billion in revenue (7% increase year-over-year). Smart home monitoring and security is expected to reach $4.6 billion (17% increase year-over-year). This includes smart thermostats, smart smoke and carbon monoxide detectors, IP/Wi-Fi cameras, smart locks and doorbells, smart home systems with smart switches and dimmers and outlets. Wireless earbuds continue to show double-digit growth and are projected to see $2 billion in revenue this year (46% increase year-over-year). Smartwatches, now with a strong focus of fitness, are forecast to reach $4.7 billion (19% increase year-over-year). Drone sales are expected to reach just over $1 billion in revenue (4% increase year-over-year). Increased usage for aerial photography and drone racing is a main factor of increased revenue.Consumer streaming services will also see continued growth in 2019. Total spending on music and video streaming services is forecast to reach $26 billion in revenue, a 25% increase year-over-year. Further, consumer spending on subscription video streaming services is expected to increase to $18 billion in 2019, up 27% year-over year. As consumers continue to bring connectivity and artificial intelligence (AI) into their everyday lives, personal data becomes an important commodity. It’s essential that the data collection and its protection are transparent processes in the tech ecosystem. Comscore’s Halo Effect Research was one of the first industry studies to demonstrates that ads appearing on premium content sites deliver significantly higher branding effectiveness than the same ads in non-premium content. Now new research from Group M UK in partnership with Newsworks, the marketing firm for premium newspapers, finds that exposure to advertising on premium sites drives greater engagement, better brand response, and is also more cost effective than the same advertising on the run of the internet. The findings are based on over 28,000 survey responses across 84 campaigns in the UK and 398 million impressions. Importantly, the positive perception of quality content extends to the ads on the page. The more that readers engage with trustworthy information, the more trusting they are of the ads they see on the premium sites. 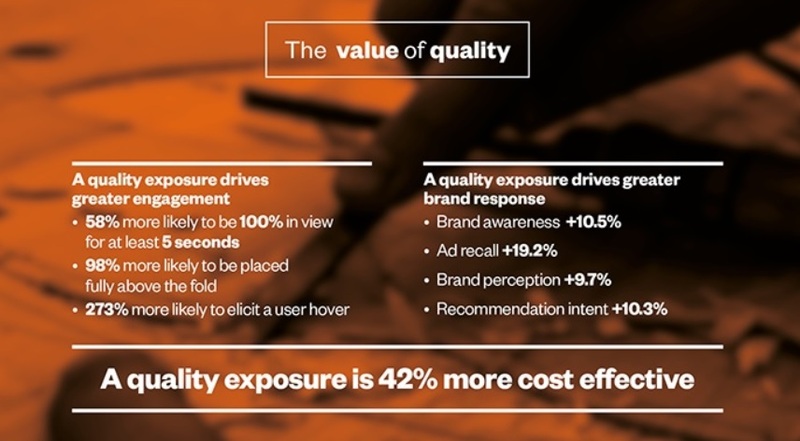 This research should encourage marketers to think about the cost per quality impression and not just the purchase of low-cost impression. Advertising is a fundamental part of news publishers’ revenue model. Within the digital advertising marketplace, programmatic and advertising technology are a large part of ecosystem. According to eMarketer, more than four of every five US digital display ad dollars is a programmatic transaction. Simply defined, programmatic is the automation of the buying and selling of desktop display advertising using real-time-bidding. Included in the programmatic is the usage of ad tech to collect and aggregate user data. A new research report, Guide to Advertising Technology from the Tow Center for Digital Journalism, looks into programmatic advertising and the influence of ad tech on the practice, distribution, and perception of journalism. Further, even though publishers require that ads on their sites contain no malware, the current ad tech setup can serve malicious codes to reader often compromising user security and privacy. The report also examines the impact of the plethora of user data collected by social media platforms on the advertising ecosystem. Unfortunately, publishers cannot compete with the unprecedented ability of Google and Facebook to collect data and in order to provide the same level of targeting opportunities and offerings. And, as stated above, publishers’ drive to collect more consumer data may have the undesired effect of negatively impacting their experience. The exploit of fake news on social media has also had a significant impact on impacts news publishers. Of specific consequence is Facebook’s change to its News Feed algorithm, which de-prioritizing news articles and content from media brands in favor of content shared by friends and families. Unfortunately, as consumers are exposed to less trustworthy content, their overall sentiment around content being trustworthy declines. Digital filter bubbles are also a concern as search engines and social media algorithmically tailor content recommendations according to a user’s consumption histories. The research found that this can get to the point that the users are only shown information that conforms with their preexisting biases. Thus, data collection – in the name of better targeting information – may actually lead to less-informed readers. Advertising still fuels the media economy. That’s why it’s important for media professionals to understand the advertising infrastructural and the role ad technology plays in digital media today. We must keep a close watch on advertising technologies, data collection, digital delivery and continue to weigh their impact on the reader experience and our ability to deliver the news they need. Audience attention on social platforms offers a strong advertising environment (good for marketers). Consumer distrust of social platforms’ data and privacy practices detracts from their effectiveness (bad for advertisers). Marketers and media executives discuss the social media advertising paradox ad nauseum in meetings, forums, and conference panels. Still, a whole lot of advertising dollars are being invested on Facebook regardless of its lack of transparency, data sharing, and stories of the company’s mismanagement and mishandling of data. In fact, Facebook’s Q3 2018 earnings cited a 33% year-over-year increase in advertising revenue while user growth remains stagnant in its larger markets. Streetbees’ new research report, Re-positioning, reflects on this dichotomy. A full 86% of respondents follow brands on social media and 73% agree that a social media presence is necessary for brands to be successful. This research ranks Facebook as number one among consumers 25 and older for following brands (86%). Thus, the findings showcase Facebook as a positive environment for advertising placement. Yet the research also finds that one-third of consumers in the US and India, Facebook’s two largest markets, do not trust the social network to keep their data safe. Further, nearly all users surveyed (98%) state that they continue to use Facebook even though they do not trust the service to protect their personal data. Yes, the paradox, a platform of users that do not trust its environment. Streetbees’ consumer findings are analogous to advertising practices on the platform. Both consumers and marketers alike continue to use Facebook regardless of the mounting distrust of the platform. In October, Fortune exposed that Facebook inflated its video metrics for how long users were watching video content by up to 900%. Despite a steady stream of Facebook mea culpas, advertisers continue to purchase advertising on the platform. The research also suggests that Facebook needs to focus on user retention. Younger audiences show limited interest in Facebook and older users’ attention appears to be waning. Only one in five of those under the age of 25 think Facebook is the “coolest” social platform. 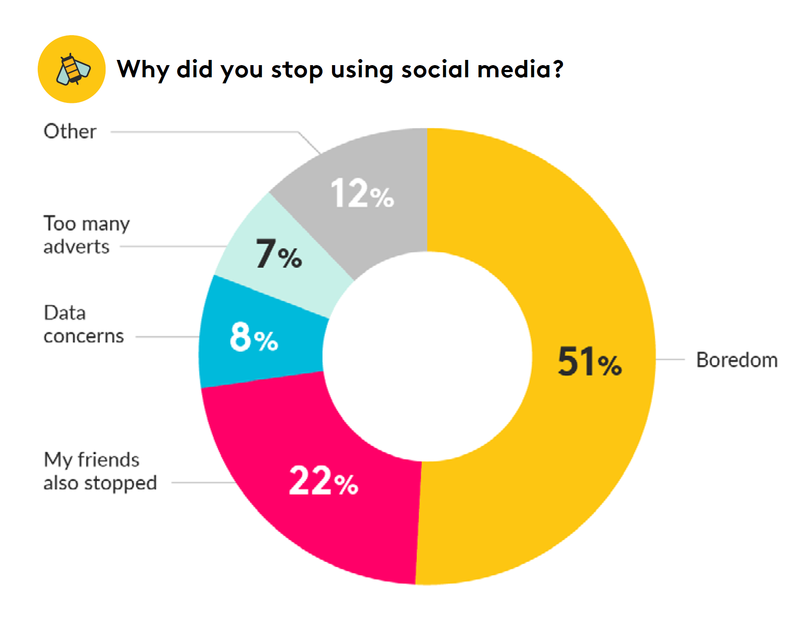 And when it comes to consumers reasons for quitting social media, the top two responses include “boredom” (51%) and “my friends stopped using” (22%). Eight percent also quit due to data concerns. As Facebook confronts user fatigue, growth in daily active user is significantly slow. As social media challenges continue to emerge, advertisers need to hold platforms accountable. Short-term media strategies will not lead to marketplace sustainability. Audience attention is a critical commodity in the advertising paradigm and continued reliance on distrusted environments will undoubtedly harm the long-term success of the digital advertising model. Native advertising: Is there still room to grow? Seventy five percent of consumers report that, if content piques their interest, they’ll engage with it, regardless of whether it’s branded or not, according to Reuters. That’s the beauty of native advertising. Unlike display ads or banner ads, native ads don’t have to look like ads. They are non-disruptive and introduce the reader to advertising content without sticking out like a sore thumb. Native was once one of the hottest trends in online ads. However, the total number of advertisers has stagnated, starting around the beginning of 2017. Only about 11% of online advertisers use native formats these days. And brands that buy native ads only run them across 10% of the sites where they advertise. What caused this shift? Certainly, online ads should be fair, clear, and engaging. Unfortunately, at times, native ads can be almost too inconspicuous, as they weave seamlessly into the platform where they appear. Additionally, the process of crafting a native ad or campaign is a costly, multistep process involving a lot of collaboration and time. And, without unified standards, it’s especially hard to gauge performance metrics like return on investment (ROI), impact, and effectiveness. 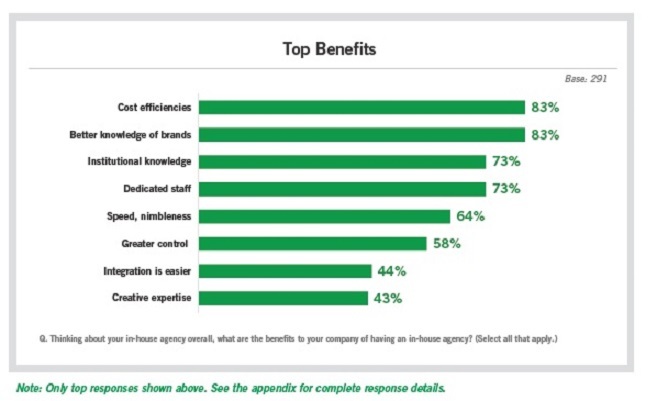 For these reasons, some advertisers see too many challenges with creating an effective native advertising program. On the flip side, many would argue that the benefits of native advertising outweigh the negatives. Native display ads receive a higher click-through-rate (CTR) than typical display ads. According to an AppNexus whitepaper, CTR is actually 8.8x higher with native display ads. Moreover, two out of three GenZ, Millennials, and GenX consumers trust branded content more than traditional advertising, finding it more entertaining, thought-provoking, and impactful, according to a Time Inc. study. Furthermore, a Collective Bias survey found that one-third of Millennials say that they’ve purchased something as a result of a sponsored post and nearly 37% agree that useful and high-quality posts offset any objections they may have to branded content. Based on these findings, it’s not surprising that the industry investing most in native advertising is Media & Entertainment with over $269mm. Top spenders include Comcast Corporation, Hulu, and Cox Communications. The Finance & Real Estate and Technology sectors tie for second place, both investing $75mm, with Professional Services and Retail not far behind, spending $57mm and $46mm respectively. Overall, MediaRadar’s study found that, while the native market is maturing, there is still room for growth. In North America, where users have become accustomed to branded content, brand advertisers must differentiate themselves from competitors. They can do this by focusing on their most profitable products, reworking existing products that underperform, or refreshing their offerings with new innovations. While publishers must continue to perfect their offerings for native to reach its full potential, the advertising format still has plenty of opportunity for growth in the future. 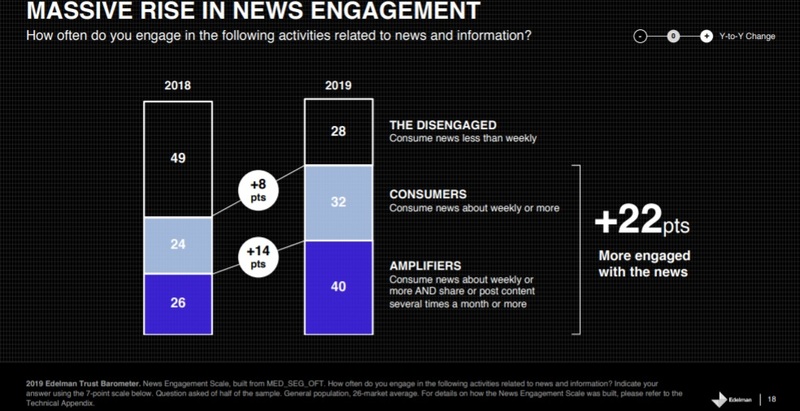 Consumer engagement is a critical component of news publishers’ direct to consumer revenue strategies. According to the International News Media Association’s (INMA) new report, Unpacking the Reader-Subscriber Lifetime Customer Journey, every publisher component from content to membership programs and e-newsletters, must reflect a strong and unified value proposition to consumers in order to be habit-forming. The report includes highlights of Charles Duhigg, a Pulitzer Prize-winning journalist and author of Power of Habit, explanation of the science behind a habit formation. Scientists refer to this as “the habit loop” and it can easily apply to reader engagement. Every habit has a cue, routine, and reward. Duhigg explains that people stop “thinking” when they perform habitual activities. In fact, about 40 to 45% of what people do every day are routine based decisions (habits) rather than conscious decisions. Publishers should aspire to their content being habit forming. However, to create a new habit, there needs to be a clear and distinct reward. It’s even better if the reward is immediate. Interestingly, Duhigg believes educating people about the “habit loop” helps to change their behavior. If the reward is clear, consumers understand the payback of their actions and accept them more easily. Rewards don’t just need to be monetary or transactional; they can also be emotional. Reach: How many consumers are reached by WSJ content at any given moment? Consumers are identified in two distinct groups a) subscribers and b) potential subscribers. Quality: Are the consumers reached the ones who will return to consume more content? Will they promote WSJ content to friends and family? Habit: Is the routine habit forming? When you build a reading habit, the consumption cycle continues. The INMA report also features Matt Skibinski, from The Lenfest Institute, and cites his definition of engagement: “when readers find your content, products, and brands valuable enough that they are willing to pay for it.” Skibiniki believes publishers should look at the occasional reader, the regular reader and the one-time reader to classes of readers will help identify the different signals of engagement. The INMA report finds consumer engagement to be the most important outcome of direct to consumer revenue strategies. It’s when habits and emotions create a pattern of repetition. It’s also when retention trumps acquisition in a publisher’s relationship with its audience. And INMA concludes that the greater the engagement, the greater the consumer revenue. The DCN Quarterly Revenue Report (QRR) delivers a quarterly pulse of the premium digital marketplace. The report includes a quarterly trend analysis of display and video revenue and sales metrics across desktop, mobile and tablet. No other competitive reports like these exist in the marketplace. If you are interested in learning more about this report and other DCN benchmark reports, please contact Rande@digitalcontentnext.org. The media M&A market is booming. 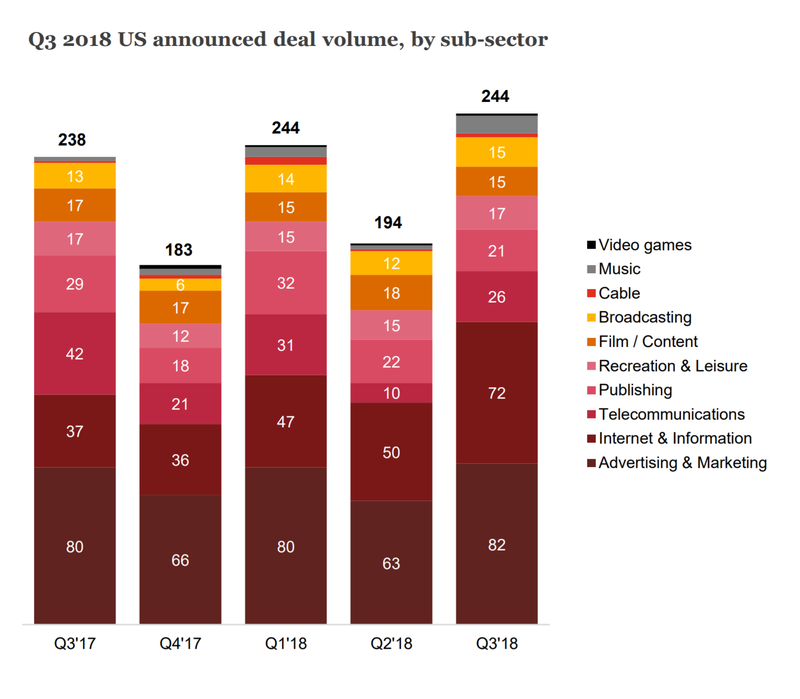 PwC’s new report, US Media and Telecommunications Insights Q3 2018, finds that deal volumes have reached a two-year high in Q3, registering a 9% increase compared to the same time period one year ago. Beyond sheer volume, the strategic rationale underlying the deal activity highlights the continued importance players are putting on M&A to further their position in this competitive and ever-changing landscape. This year, many companies put innovation and consumer engagement at the forefront of their acquisition strategy. Beyond the usual motivations, companies are also looking to make acquisitions that include offerings that help them attract, engage and retain customers. New deals do not surpass $5 billion dollars, resulting in a 43% decrease in deal value compared to Q3 2017. F five deals this quarter are over $1 billion dollars, accounting to $12.4 billion dollars or 69% of total deal value. The largest deal in Q3 is Adobe’s $4.8 billion-dollar acquisition of Marketo Inc., a cloud-based marketing platform for B2B customers. The Advertising & Marketing and Internet & Information sub-sectors continue to outnumber other categories in terms of deal volume with 82 and 71 deals, respectively, in Q3 2018. Private equity deal volumes are growing strongly this quarter, representing 26% of all deals. However, the value of private equity deals shows a 21% decline this quarter. Significantly, many of the deals in subcategories such as Internet & Information and Advertising & Marketing show that investors are looking to acquire new platforms rather than building them. This is especially true of companies that can easily add a new service to an already existing platform in order to grow their user base. Many companies are also competing for advertising dollars and consumer engagement so they looking to invest in new platforms and new technologies to deliver personal and immersive experiences. Importantly, new acquisitions this quarter show that companies are responding to changing consumer viewing and listening habits and shifting revenue streams. A new and notable area of growth includes podcasts. The podcast industry is growing substantially. In just five years the audience grew to grew over 325% to 98 million listeners so, or roughly 30% of the US population. In this quarter alone, there are nine podcast deals, four of which involved podcast production companies. Additional areas for further acquisition exploration include virtual and augmented reality platforms, as well as egames (multiplayer video-game competition platform and alternative content formats created purposefully for smaller screens and shorter attention spans). As these areas continue to grow, the M&A scene is likely to keep growing and be reflective of organizations’ nee to continue to innovate and grow. According to a new study by Forrester, many big companies struggle to develop and deliver advertising that is highly relevant and personalized. Whether it’s due to stodgy internal processes, bad data, or a dearth of appropriate technology, large organizations haven’t yet been able to make personalized advertising tactics a part of their marketing operations. To gauge marketplace sentiment, Forrester talked with 100+ senior marketers at U.S. companies with more than $1 billion in annual sales. Personalization is one of the few issues in marketing that genuinely impact all three primary constituents – advertisers, platforms, and audiences – equally. The advancement of true customized advertisers will lead to better outcomes to everyone in the mix: Advertisers will improve ROAS, platforms will be able to charge more, and audiences will have superior experiences. It’s a win-win-win. Personalization, one-to-one marketing, customized messaging – call it what you will – but make it a bit part of your pitch, as soon as possible. If it’s already there, emphasize it more, and maybe even lead with it. Personalization is subjective, and means one thing to a startup and something completely different to a $10 billion category leader. If you’re an established publisher, promote personalization even at the risk of putting mainstay features like superior reach and rich audience data on the back-burner. The marketplace already knows you have these offerings – that’s the benefit of being around for awhile – but might think you’re lagging in the area of personalization, like they are. Let them know otherwise, in no uncertain terms, and get aggressive about it. Whether it’s because of bad data, lack of technology, regulatory restrictions (real or perceived), or stifling internal politics, many big brands aren’t able to manage personalized campaigns with internal resources. But most are able engage with external providers to do so. Either through the application of creative (“innovative”?) techniques that rely on data segmentation and labor-intensive methods, or via the litany of ad technology flooding the marketplace, publishers of every stripe and size are in a favorable position to deliver targeted marketing solutions. Getting there might require an unorthodox product design strategy, but it’s there for the taking. Personalization is an area where traditional publishers have a unique window of opportunity these days. While the eyes of the world remain fixed on the duopoly’s every move, there isn’t a lot of interest or bandwidth to cover the rest of the marketplace, affording other players more room to maneuver. These market conditions won’t last favor, but a window currently exists. And for publishers interested in making bold moves, personalization could be a appropriate fit. Knowing how valuable personalization can be for brands, and how significantly many are struggling to employ the tactic, publishers that find a way to help advertisers quickly and easily incorporate personalization into marketing operations will be able to meaningfully differentiate themselves from the competition – including the duopology. Tim Bourgeois (@ChiefDigOfficer) is a principal at East Coast Catalyst, a Boston-based digital media audit company. Last month, YouTube experienced an outage for about an hour and the internet got a taste of what would happen if the platform disappeared. The results were surprising: Internet behaviors shifted immediately and fiercely. There was a huge overall traffic surge, with some of the largest increases seen on app and search traffic. 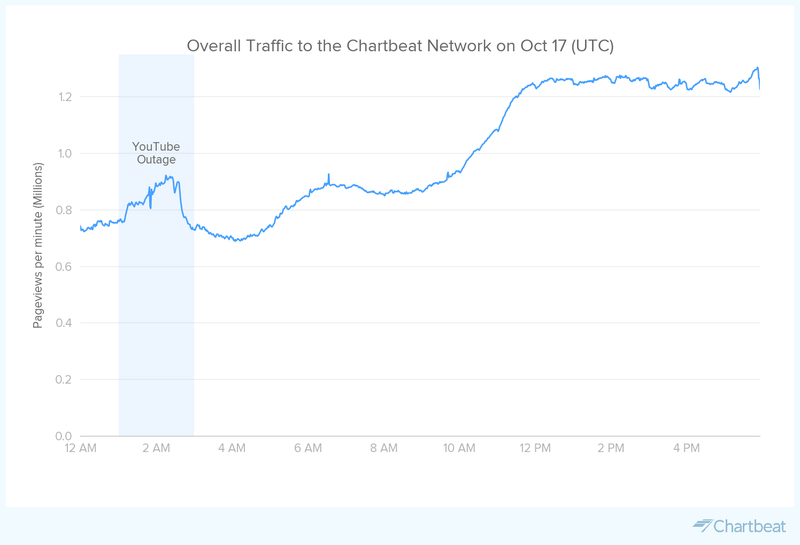 Chartbeat analyzed the YouTube outage using global traffic data across a sample of more than 4,000 sites. Overall, this outage resulted in a 20% net increase in traffic to publisher sites. Just over half of this increase (11% of overall traffic) went to general articles on publisher sites, while articles about the YouTube outage comprised a 9% lift. It makes sense that since 45% of the traffic lift came from articles about the outage, we saw a large boost in search traffic, with readers likely searching for answers regarding the outage. As we look at how and where people read during this outage, we saw app and Google AMP traffic seeing the largest surges, with 78% and 67% lifts respectively. We also saw boosts across desktop, but mobile and tablet saw even larger increases. 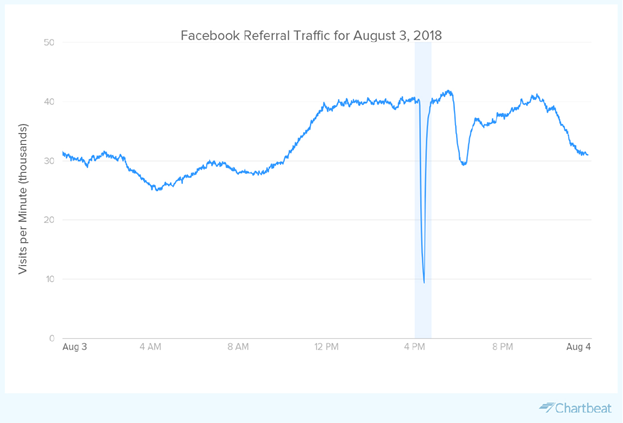 We compared this traffic boost to the Facebook outage on August 3rd, 2018, which brought a 2.3% net increase to publisher traffic in the 45-minute outage window. Similarly, the late August Reddit outage didn’t even make a blip to overall publisher traffic. In the Facebook case, only a negligible amount of that traffic went to articles about the outage. There are a couple potential reasons for the vast difference in traffic increase in the YouTube outage vs. the Facebook outage. YouTube is not normally a traffic driver to publishers: Unlike Facebook, YouTube does not refer a great deal of traffic to publishers. Thus, the effect of people moving from YouTube to publisher sites during the outage had a dramatic impact and was purely additive. Day and time difference: Facebook’s outage occured on a Friday afternoon (US time) / evening (Europe/Asia time). Thus, the majority of people were likely at work or out for the evening. It wasn’t prime news-reading time. The YouTube outage, on the other hand, was on a Tuesday evening (US), which is prime couch time. So far, we’ve seen there’s no single reaction when a platform goes down. Sometimes people are more apt to search for answers, sometimes they go directly to a news source they trust. The one thing we do see is that when Facebook or YouTube goes dark, the rest of the internet comes alive. How do Facebook’s News Feed algorithms impact non-profit publishers? The Facebook’s News Feed, introduced in 2006, was once a strong source of traffic for many publishers. News organization utilized the intermediary platform to grow their audiences. The social sharing of news also altered the direct-to-consumer paradigm. Earlier this year, Facebook announced that their News Feed would prioritize posts from friends and family over news content. While some news publishers faced modest declines, others reported significant ones. Chartbeat, a content analytics platform, provided data showing Facebook traffic to publishers declined 6% since the beginning of January. However, LittleThings, a publication focused on feel good stories and other content for women, claimed they lost 75% of their referral traffic due to changes in Facebook’s New Feed and subsequently shut down. In its latest research, The Shorenstein Center on Media Studies explores the impact on non-profit news brands. Non-profit news organizations rely heavily on social interaction to help encourage donations. A traffic decline could negatively impact donation revenue. Shorenstein’s new report, Facebook Friends? The Impact of Facebook’s News Feed Algorithm, offers a custom analysis of eight non-profit news publishers. The research divides the publishers into two categories: investigative and single-subject. The investigative group focuses on producing investigative journalism on a wide range of topics. The single-subject group produces investigative journalism in the context of a single subject. The three investigative organizations include The Center for Public Integrity, ProPublica, and Reveal from The Center for Investigative Reporting. The five single-subject organizations include Chalkbeat, The Hechinger Report, The Marshall Project, The Trace, and The War Horse. The analysis focuses on two key metrics – total users and total sessions – looking at the three months prior to and after the News Feed change. In the three months after the News Feed changes, in terms of overall traffic, the investigative organizations saw small changes in both the number of users and the number of sessions. In contrast, the entire single-subject cohort registered growth for these two metrics. The analysis also looks at the composition of traffic, where the traffic is coming from, by using the Google Analytics channels Direct, Email, Organic Search, Other, Referral, and/or Social. Referral traffic was most consistent; increasing both in users visits and sessions. Only two of the eight non-profit publishers show social referral increases. Not surprisingly, Facebook referrals closely follow in line to social. Given some of the non-profit news publishers registered small to moderate traffic increases, the Shorenstein research hints to Facebook’s potential growth path for non-profit news publishers, even with the algorithm changes. The difference between larger commercial news publishers and non-profit may be due to how non-profit new organizations’ stories are shared on Facebook. More research on this is needed to understand the consumer experience sharing content from commercial news publishers compared to non-profit news publishers. Are mobile news aggregators on the rise as referral traffic sources? Often top referrers to articles in our network include a mix of the usual suspects: Google search, Google News, Facebook, Twitter, Flipboard, Drudge Report. But one day at the beginning of October I was looking at a story in Currents and noticed another referrer in the mix: SmartNews. SmartNews is an app that aggregates and serves “impartial, trending and trustworthy” news through machine learning algorithms. 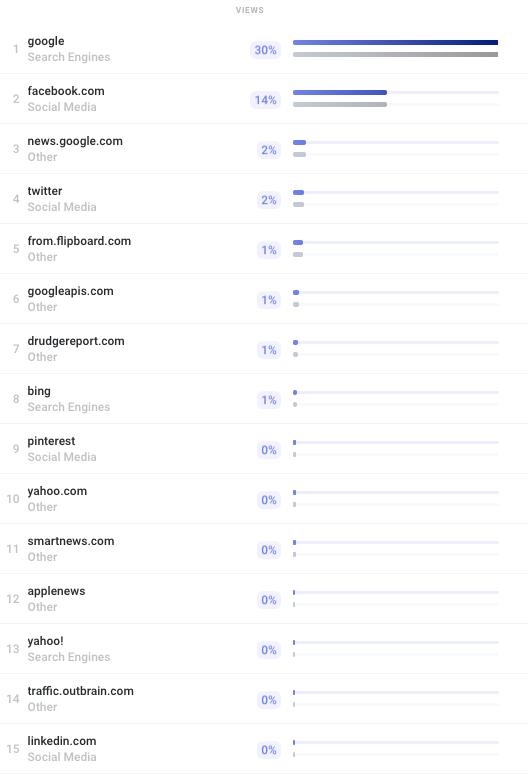 And for the story I was looking at, about the FDA and e-cigarettes, SmartNews was the second highest external traffic referrer, right after Google Search. Then later this month, another colleague was keeping up with the Mega Millions lottery news (she didn’t win) and noticed another unusual referring domain: discover.google.com. We’ve written about trends in non-search Google referrers before, including non-search AMP traffic and Google Quick Search Box, but this was a whole other domain. We couldn’t help but wonder what was going on with these mobile referrers, and how they affecting were traffic to publishers. I took a closer look at the traffic trends to find out. My colleague who owns an Android phone said she’s used to seeing SmartNews alerts pop up. However, she didn’t realize how many people had the app pre-installed on their devices or were opting in to the same experience. 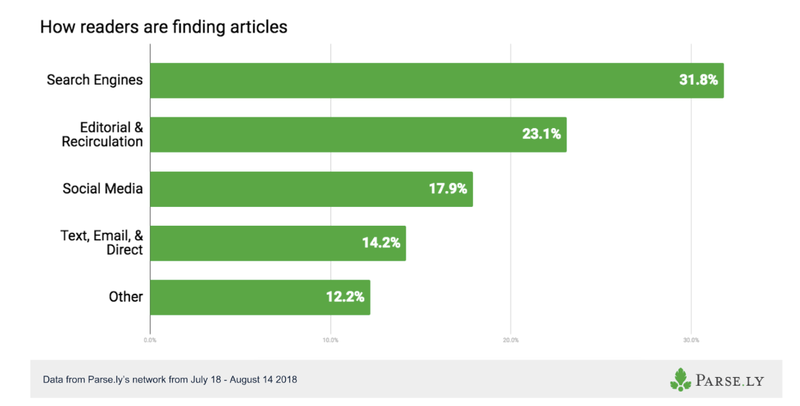 SmartNews has been growing as a referrer, with VentureBeat reporting 200% growth year-over-year in the U.S. and 10 million monthly active users. Looking at page views to articles since April, it’s clear that there’s an uptick. 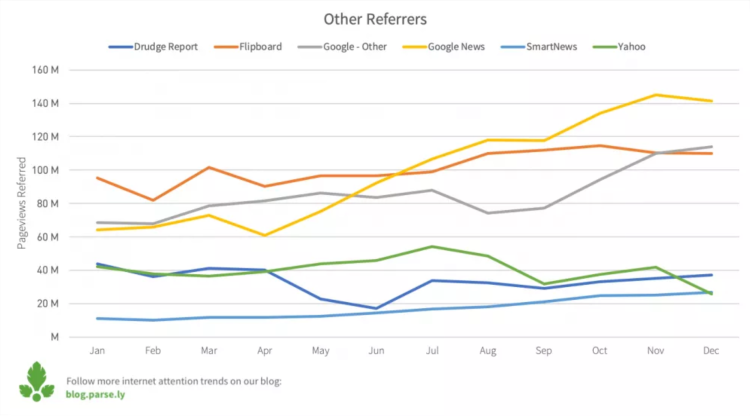 The highest peak in referral traffic from SmartNews happened this month. In fact, SmartNews has even edged its way into the top fifteen overall referrers so far in October. Though it drove under 1% of traffic, SmartNews ranked 11th, right behind Yahoo and ahead of Apple News. The Percentage of all network views referred from October 1 – October 26, 2018. The top stories with traffic from SmartNews this month are about Law, Government, and Politics, News, Business, Health & Fitness, and Science. Though the referring domain discover.google.com didn’t make it into the top overall traffic sources in October, it appeared seemingly out-of-the blue. Traffic from the referrer to our network begins suddenly on October 18. So where exactly is this mysterious traffic coming from? Turns out it’s coming from the artist formerly known as Google Feed. In September, Google Feed rebranded as Google Discover. So far according to our nine days of network data, the information Google Discover users cared about most included these top five categories: Law, Government, and Politics, Technology & Computing, Business, Sports, and Science. 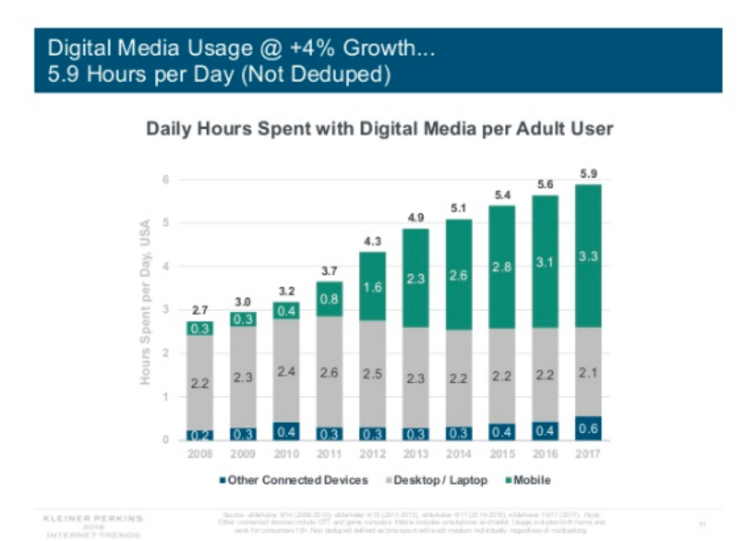 Given that U.S. adults are spending an average of 3 hours, 25 minutes a day on mobile devices in 2018, according to eMarketer, it may be no surprise that more and more readers are finding news through mobile news aggregators. 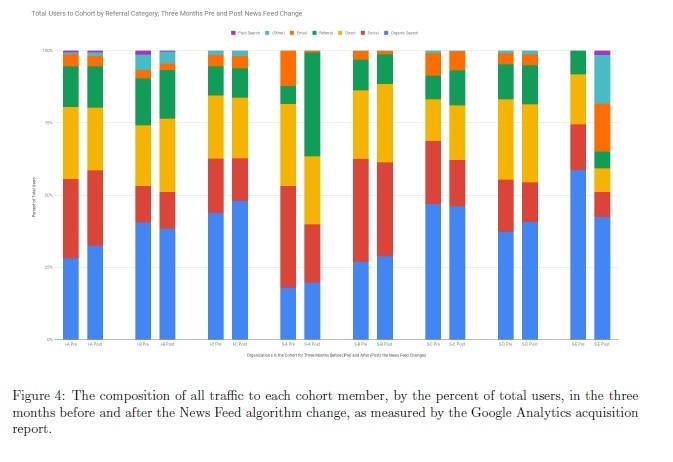 In their 2018 digital news report, Reuters Institute found that over half of respondents got news through interfaces that use ranking algorithms, including search, social media, and news aggregators. The same amount of respondents (6%) treated email, mobile alerts, and news aggregators as their respective main gateways to news. What does this mean for publishers? It might be worthwhile to keep your eye on growing news aggregator referrers, especially if you’re trying to reach a younger demographic. According to Reuters, aggregators are most popular among 25 – 34 year olds and 18 – 24 year olds. Compare that to email and direct access, which are most popular among 45 – 54 year olds and people aged 55+. Have you noticed any mobile referrers take off lately? Let us know—we’re keeping our eyes peeled. Publishers use social distribution to keep up with consumers’ news consumption habits. And despite the annoyance and uncertainty of platform policy changes (e.g. Facebook news-feed changes), publishers continue to align their business strategies and social practices. 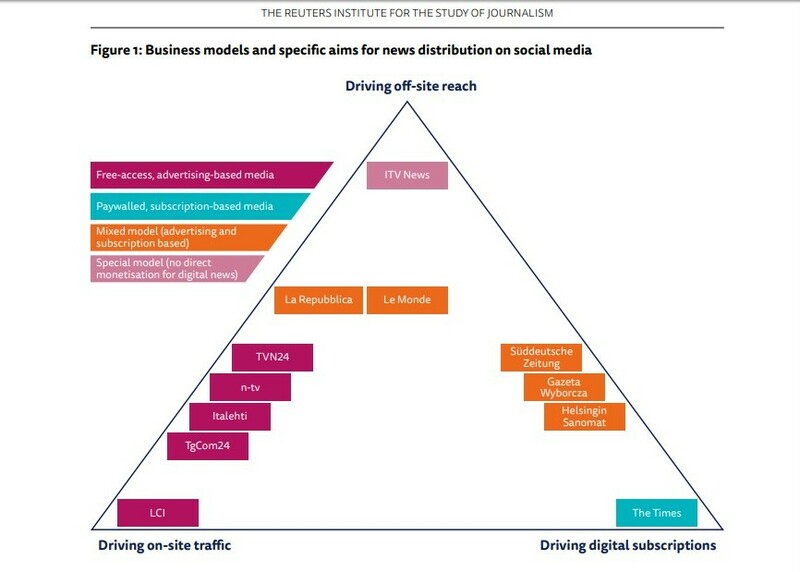 To better understand this alignment, the Reuters Institute explores distribution strategies across 12 news publishers in six European countries in their new report, Digital News Project. Based on this sample, social platforms offer limited opportunities for publisher monetization. Nevertheless, news organizations can receive indirect benefits in terms of traffic, off-site reach, and/or subscriptions. Facebook accounts for the largest share of publishers’ social media traffic. It also delivers higher levels of audience engagement and is considered more cost-effective at driving digital subscription sales. Twitter offers the most value for generating off-site reach and greater visibility with breaking news. It’s the go-to platform to reach journalists, opinion leaders, trendsetters, and influencers. Instagram has the potential to deliver high audience engagement and promote news brands, especially to younger audiences. It’s a great fit for light content like entertainment news. Publishers view Instagram as experimental. The Digital News Project also examines publisher practices on Facebook after the January 2018 policy change to deprioritize news publishers’ content in favor of family and friends’ posts. Analyzing these practices provides a performance review of news sites’ social platform strategies. For example, Iltalehti, the Finnish tabloid, continues to publish as often on Facebook after the policy change. However, Facebook’s new policy resulted in a 28% decline in Iltalehti’s average daily interactions. Unfortunately, Iltalehti’s bottom line is severely impacted since the publication relies heavily on social traffic referrals for monetization. It’s important for news publishers to identify their objectives before implementing social distribution strategies. The social approach should allow publishers to experiment with new opportunities to drive on-site traffic, or to build awareness and brand recognition or to engage users to subscribe to paid service. Newsrooms think about the content journey and the strategies needed to keep readers moving throughout their sites. Content elements should never lead to a dead-end but rather connect to other content on the site. The goal is strong recirculation, a measure that shows how much of an audience goes from one piece of content to another on the site. It also helps newsroom evaluate their strategies to optimize the way in which they move their audience through the site. The wording used to describe the links. In total, an average of 1.42% of those who visited the news sites during the study clicked on a content link. While 1.42% is a low rate of engagement, it did outperform industry-norms. Outbrain, an online advertiser specializing in presenting sponsored website links, reports healthy click-through rates somewhere between 0.10 and 0.25%. Images with links generate 63% more clicks than those of text-only. Links at the end of a page generate 55% more clicks than links in the middle of a page. Further, links at the end of the page are even more successful on mobile. Related content links earn 14% more clicks compared to popular content links. However, popular content generates more clicks when the referral page is located on Facebook. Keeping messaging simple matters. Generic wording (e.g. Related Stories) earns slightly more clicks than more complex wording (e.g. What Else People Can Read on This Topic). The study confirms industry findings that only a small percentage of users click on content links. However, the study also shows specific elements in design, layout and messaging can influence clicks in a positive manner. It’s important for newsrooms to explore these elements and other practices to test what best helps guide readers through an engaged content journey. Popular malware blocking or filtering technologies can go a long way in preventing bad ads from impacting your business’ bottom line. But they’re not a one-stop solution. Much like a quarterback relies on the assistance of his teammates, blockers also function optimally when paired with other smart technologies and tighter security policies. The Media Trust Digital Security & Operations (DSO) team recently uncovered just how weak malware blockers can be when relied upon as a single malware solution. It’s vital that businesses recognize the danger of relying solely on malware blockers to thwart attacks. They must also take the time to build a better game plan to tackle incoming threats. A big problem with treating malware blockers as a security solution is that they’re rife with issues. Take malicious domains, for example. Recently, a notable domain, known as “dq6375rwn2aoi.cloudfront.net” made its way onto many suppliers’ watch lists. Yet it still managed to sneak beyond malware blockers. The domain in question was disguised with additional code that made it unrecognizable and, therefore, unreadable by the blocker. This technique is known as obfuscation and it’s posing a massive problem in the malvertising space. According to the DSO team’s analysis, when the right conditions are met, the malware presents users with a fake “you’ve won” pop-up that prompts readers to claim a reward. When users click OK, they are taken to a website that requests for sensitive, personal information like name, email and telephone. The DSO team quickly identified the malware and worked with the publisher to terminate the ads at the source, protecting its’ 900,000 weekly audience members. In just one day, the team uncovered similar obfuscated malware executing in 16 other client websites. All of them had one thing in common: They used the same malware blocking solution. There are several reasons why blockers provide only a partial solution to preventing bad ads. For starters, at least 90% of malware used in malicious mobile redirections are obfuscated. And that already-high number is growing. There’s also the conundrum of code that can identify and work around specific tools; if the malware detects the presence of a known provider’s tool, it will change tack and behave differently. Finally, blockers often use third-party malware data which quickly goes stale, thanks to new malware being introduced quicker than the data can track. This issue is so rampant that the DSO team finds a new attack every 30 seconds and classifies at least 5,000 new active malicious domains each month. According to The Media Trust’s analysis, third-party malware data sources take an average of three to five days to identify and record malware. As a result, by the time a third-party filter is updated, 8,600+ attacks could have occurred over a three-day period. That’s at least 14,400 attacks over just five days. For context, a single attack can affect millions of devices. It’s also important to note that some blockers shut down good ads or block legitimate digital partners like DSPs because of false positives in the data they use. This overzealous approach to rooting out bad ads and bad actors will reduce a publisher’s revenues and can undermine their reputation with a good digital partner. Additionally, when good ads are suppressed, the user experience becomes needlessly compromised. The fact is, while blockers can help, they cannot eliminate malvertising. Until machines can match the craftiness of human programmers, companies should supplement their preferred blocking solution with other measures to reduce risk. As regulations like the GDPR and the California Consumer Privacy Act evolve and spread, a single breach can have a huge impact on a company’s finances, performance and reputation. Businesses can mitigate falling victim to these consequences by staying one step ahead of the curve. A good place to start is by devising a game plan that analyzes the opponent’s behaviors and timing. Here are some tips on how companies can take — and keep — the lead. As mentioned, a new malware attack hits the ecosystem every 30 seconds. Many blocking solution vendors use compiled synthetic and data sources that are updated every three to five days. Companies should choose a blocker that offers more frequent updates, preferably around the time when new malware is discovered. Ad experiences consist of a creative, a tag and a landing page, each of which can be infected. Ten percent of malware that the DSO team detects infect only landing pages. This is likely because most blocking tools ignore these pages, along with site-level malware. Publishers should find out whether the blocker sees these different components, and whether or not they block them when they’re infected, and how. Blockers do a good job of rejecting ads with malicious URLs until the latter are obfuscated to avoid detection. Blockers should identify malicious URLs, along with malicious domains and bad hosts. This way, no matter what form the URL takes, the blocker can identify the malware via its host and domain. As we’ve seen, this is a huge and growing problem. Legitimate developers obfuscate code to protect intellectual property, while malware developers do it to escape detection. Obfuscation should be reason enough on its own to make companies want to tighten their security policies around malware. Malware blockers can be useful tools, but not when they function as the only security tool. Keeping bad ads at bay absolutely requires that companies implement a multi-layered, proactive approach by incorporating other tools and policies into the mix. Regular monitoring of the website from a customer’s view will also allow companies to understand who and what is executing on the website to be able to take action to block code when required and stay compliant. Chris Olson co-founded The Media Trust with a goal to transform the internet experience by creating better digital ecosystems to govern assets, connect partners and enable Digital Risk Management. Chris has more than 15 years of experience leading high tech and ad technology start-ups and managing international software development, product and sales teams. Prior to The Media Trust, Chris created an Internet-based transaction system to research, buy and sell media for TV, radio, cable, and online channels. He started his career managing equity and fixed income electronic trading desks for Salomon Brothers, Citibank and Commerzbank AG. Media companies have a well-documented love/hate relationship with Google. Though search engines undoubtedly make content discoverable to vast audiences, the disintermediation of sources has devalued the brands that invest significant resources in creating credible information. 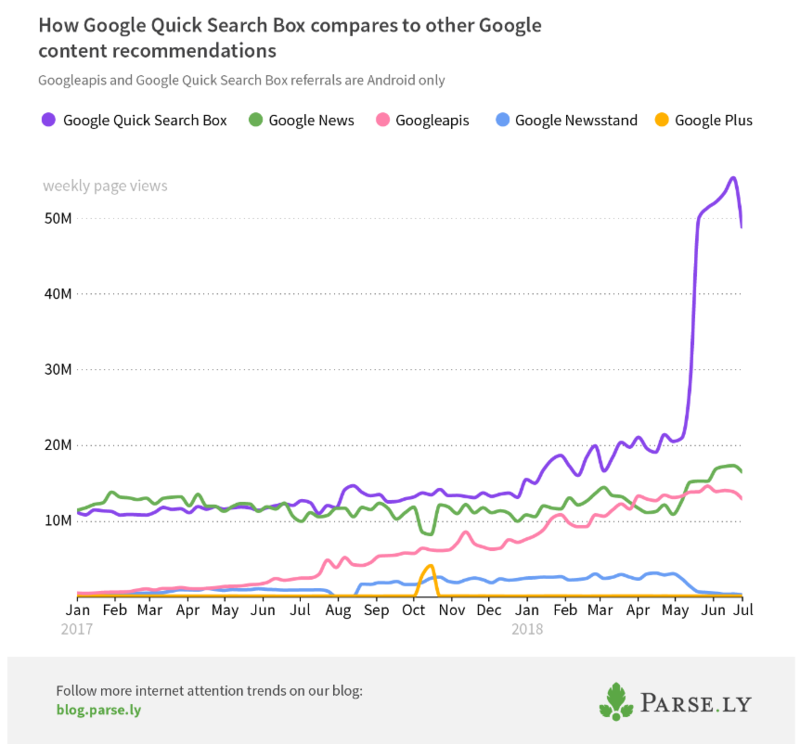 Google also dominates digital video (YouTube) and is a major force in mobile (Android), giving it even more power over content distribution, consumption, and monetization. So, publishers are rightfully wary when Google offers to support journalistic endeavors. The EJO’s data, which is based on a project registry that they scraped from the Digital News Initiative (DNI) website and then coupled with additional reporting, sheds light on who Google gives money to and what kind of projects are funded by the Internet giant. They found that the typical recipient of Google funding is a commercial legacy institution in Western Europe. Meanwhile, non-profit news organizations and public-service media rarely receive funding. A large part of Google’s money goes to “the media establishment,” with more than half of the European funding allocated to long-standing commercial publishing houses, including projects at Trinity Mirror, the Telegraph Media Group, and Thomson Reuters in the UK. More than half of recipient organizations were founded in or before 1997. Most (83%) are based in Western Europe. The typical recipient of Google funding is for-profit, with only 10% of funding found to be for non-profit or public-service media. A quarter of the funding is handed to non-publishing organizations, including start-ups that develop services for the industry. The big question, of course, is what Google is trying to achieve with its sponsorship. Significantly, the research points out that while projects may appear to compete with Google products, they mostly complement Google’s existing online ecosystem. In fact, the research revealed that several of the projects are based on Google services, which provides an additional benefit to Google in exchange for its support. Ultimately, it is impossible to view Google’s investment in news (or academic research) as altruistic. 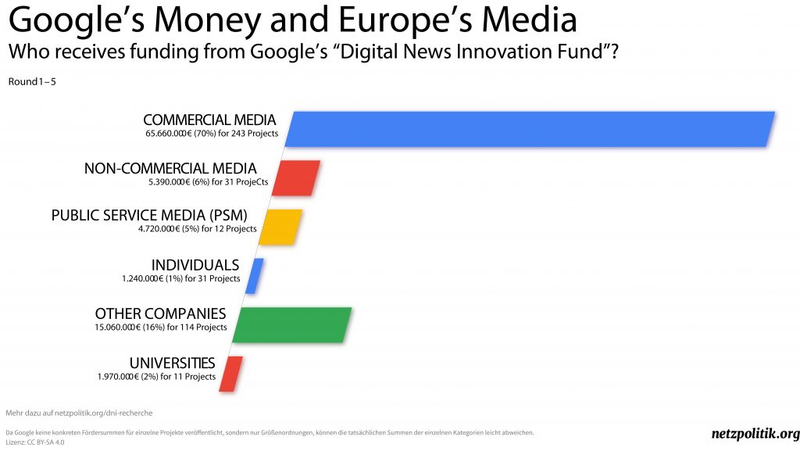 As the EJO’s research states, the funding it gives to media institutions actually helps Google safeguard its long-term interests. Citing the company’s evolution from search engine to central node for the production and distribution of news, they find that, “Google has built an ecosystem that no publisher can ignore.” Neither can publishers ignore the implications and motivations of Google’s patronage. What would the web look like without Facebook? 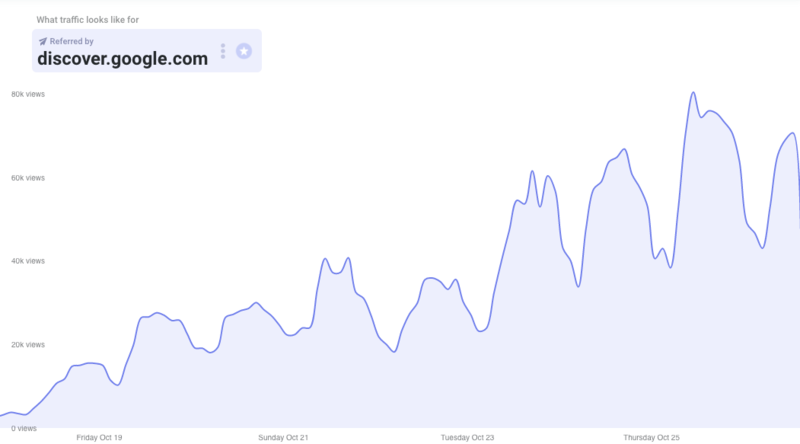 Chartbeat had a glimpse into that on Aug. 3, 2018, when Facebook went down for 45 minutes and traffic patterns across the web changed in an instant. What did people do? According to our data, they went directly to publishers’ mobile apps and sites (as well as to search engines) to get their information fix. This window into consumer behavior reflects broader changes we see taking hold this year around content discovery, particularly on mobile. And this is good news for publishers. Despite volatility driven by algorithm shifts and intense news cycles, user demand for content (represented by traffic across the web) is quite stable. But the sources of that traffic are anything but static. In fact, we’ve seen a major reversal in the specific sources driving traffic to publisher sites in the last year. Mobile traffic has seen double-digit growth and surpassed desktop, which saw double-digit declines. 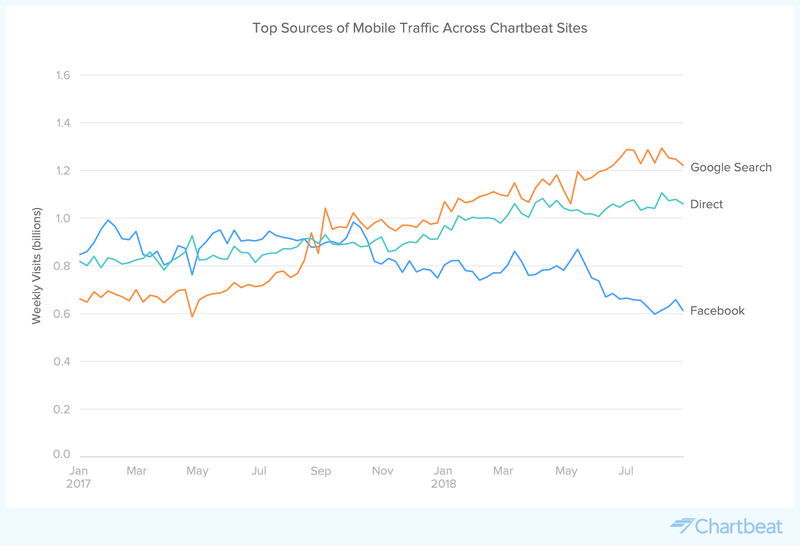 On mobile, Facebook is down nearly 40% since January 2017, while Google Search has seen a 2x growth in that same time period. That means increases in Google Search referral traffic have more than offset any declines in Facebook referral traffic. Additionally — and of significant importance — mobile direct traffic to publishers is now greater than traffic sent by Facebook to publishers’ sites. This means consumers are now more likely to get their news by typing in a publisher URL or opening an app than by being referred through Facebook. Google Chrome Suggestions, a personalized newsfeed built into Chrome’s mobile browser, is up 20x. News aggregator Flipboard is up 2x in the past year. The new Google News app, which is pre-installed on Android devices, is up roughly 60% since it relaunched in May. Built-in portal apps aren’t the only apps to watch; publisher-owned news apps are also making a comeback. According to the Digital News Report 2017 from Reuters Institute, weekly use of news apps in the US was up roughly 40% in 2017. And Chartbeat data shows that app users are not just consuming more content, but they are also an incredibly loyal audience – 5.7x more loyal on average than visitors who arrive from platforms like Facebook and Google. All of which makes the Aug. 3 Facebook incident even more interesting to observe. 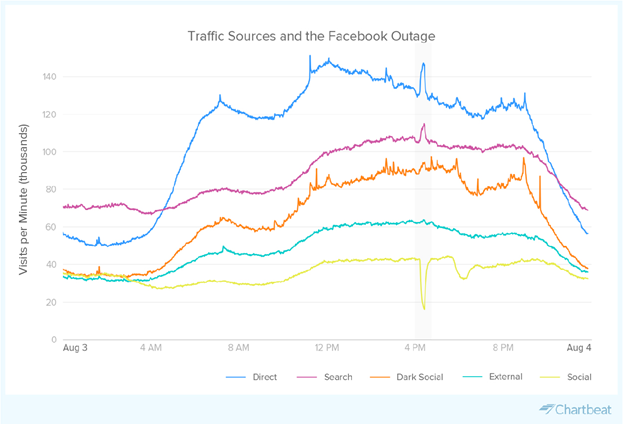 Chartbeat analyzed the Facebook outage using global traffic data across a sample of more than 4,000 sites, and presented a summary of what happened at the ONA conference. 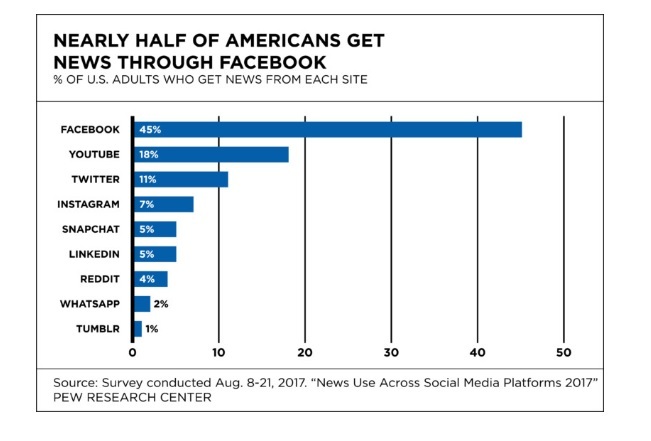 Key data points show that when Facebook went down, referrals to news sites fell as expected, but other activity more than made up for it. Direct traffic to publishers’ websites increased 11%, while traffic to publishers’ mobile apps soared 22%. Search referral traffic to publishers was also up 8%. Surprisingly, there was a net new total traffic increase of 2.3%, meaning that the number of pages consumed across the web spiked upward in this timeframe. One of the fascinating things we noticed in the data was just how instantaneous the reaction was. When Facebook went down, it took only seconds to break the habit. Habitual Facebook usage is so intertwined with mobile usage, however, that it is hard to say what would really happen in a Facebook-absent world. Would mobile consumption be the same without it? Facebook drives a tremendous amount of traffic to publishers, but at the same time, it also competes in terms of consumer time and attention. It is heartening to see that when Facebook is temporarily out of the picture, consumers still seek out the stories they want— and this is good news for publishers. This data was originally presented at the Online News Association 2018 annual conference by Josh Schwartz, Chief of Product, Engineering and Data Science at Chartbeat. You can watch it here. The spread of disinformation across social media has emerged as a critical threat to the role public information plays in a properly functioning democracy. This trend undermines consumer trust in media and many governments feel threatened by fake news and foreign intervention, especially during election times. A new report from Oxford Internet Institute, Challenging Truth and Trust: A Global Inventory of Organized Social Media Manipulation, analyzes the trend of organized media manipulation, and the growing capacities, strategies and resources that support this phenomenon. To combat the spread of misinformation, counter-narratives and fact checking portals are being created to support citizen awareness and engagement with the facts. However, some government agencies feel threatened with their countries’ response of censorship tools. The research identifies evidence of political parties and candidates using automated scripts (bots) on social media during an election process in at least 30 countries. Approximately one-fifth of the 48 countries use chat applications such as WhatsApp, Telegram and WeChat to spread disinformation campaigns. While social media has opened doors that allow friends and families to connect and share information, the power of these platforms also led to the spread of misinformation and divisive media campaigns. This research offers an understanding of how social media platforms impact public discourse. It provides a background for policymakers to inquire about social platforms use of big data analytics and “black-box” algorithms. Importantly, the research should encourage all to question the ways in which social platforms are collecting, processing, and using personal data. our analysts quickly start asking questions. Big spikes usually mean some sort of change, new product, or initiative at at platform that affects journalists and media companies. The problem is, usually the platforms don’t bother to mention it to you. “View Related Pages.” This appears in a Google webview—not Chrome—on both AMP and non-AMP pages. “Check out your feed” at the bottom of search inputs. This takes you to “interest-based” content cards. And so another Google initiative could be affecting how your content gets shown to audiences. Though there might be benefits this time around. Beyond the fact that we see (again) the power of platforms to influence how audiences find premium content, the data also shows what an impact personalization of content can have. According to Parse.ly data, internally referred traffic sends more views to articles than all of social media. This includes home and sections pages, as well as any recirculating traffic sent from article to article. Increasing these views by showing even better personalized articles has huge potential. So when it comes to content, what kind of personalization works, and how do you test it? Personalization can mean a lot of things when it comes to tactical execution. Does it mean that each reader sees content uniquely based on their reading history? Or maybe based on the section or article the user is seeing that moment? There isn’t a one-size-fits all solution for this, and media companies should be testing and adapting their personalization strategies for their audiences. Much like technology developers test user experience, this should not be a static choice that is made once for all audiences. Last year, Setareh Baig, a then graduate school intern from NYU’s Studio 20 program, tested how this would work in practice. She interviewed the product teams at The New Yorker and The Intercept and did user testing. Since The New Yorker team cares deeply about subscribers as well, other user tests could be implemented, testing whether returning visitors had the same behavior, or whether they were more likely to want to read a story they knew other subscribers had spent time with. We’re keeping our eye on the trends and traffic that Google sends publishers’ way. We’re also encouraged to see publishers take what works and adapt to their own readers. Here’s to seeing more spikes of interested readers in the future. Through a series of focus groups and a 2,000-voter survey, the research found that there is a lack of urgency around the idea that press freedom is at risk here in the U.S. According to the report, 52% of voters do not see press freedom as under threat. The lack of perceived risk that was even higher when viewed through a partisan lens: 66% of Republicans and 56 %of Independents said they perceived little or no threat to the press, while just 38% of Democrats gave the same response. As other studies have shown, trust in the national news media is low. Only 28% of registered voters report to have a great deal of trust in national broadcast news and only 23% say they have a great deal of trust in national newspapers. Despite this lack of trust, nearly all voters (95%) agree on the importance of having a free press. Across party affiliation, the research found that an overwhelming majority believe it is important that the press be free in the United States, and most voters (76%) know that freedom of the press is a First Amendment right. 1. Embrace the press’s role to inform. 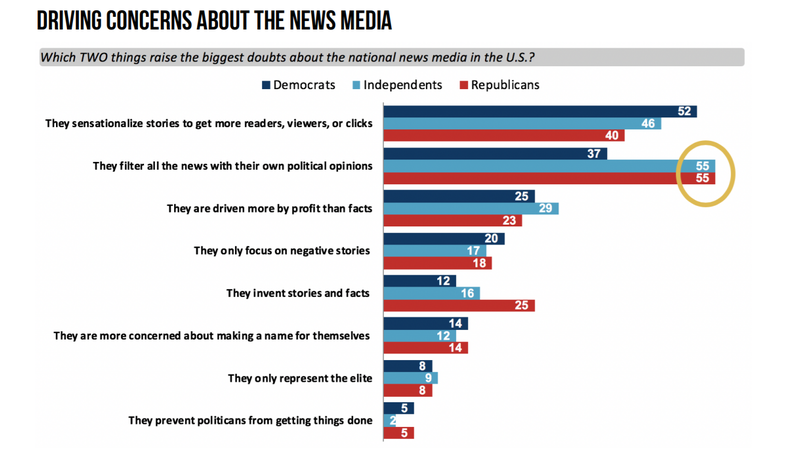 Voters want a news media that informs them of the facts. They see this as the press’s highest value and a reason to defend the press. Underscoring the news media’s responsibility to inform the public is a far more convincing reason to defend press freedom than other frames, such as highlighting the role of the press in a democracy or even making comparisons to press treatment in other countries. 2. Address the perception of bias. Voters want to hear the news that presents the full story from all sides. Bias is one of people’s top doubts about the news media. They also do not want a news outlet that just gives them news that reflects their own point of view. Significantly, some respondents expressed concern that the need to profit from the news could cause biases while others worry that powerful owners and sponsors may affect the news. 3. Keep President Trump out of the press freedom conversation. To effectively advocate across the political spectrum for protection of a free press, President Trump must be left out of the discussion. His mention polarizes focus groups participants immediately; both sides see him very differently. For right-leaning participants, he is holding the media to task and they are being unfair. 4. Build connections with conservative audiences. While an overall plurality of voters believes calling for boos and other actions against journalists is never justified, 52% believe that politicians engaging in this behavior are just reflecting public frustrations. To reach voters who have lost trust, it is important to show that treatment of the press isn’t a Trump issue, but rather a serious deterioration of the ability of the press to inform. The survey data points to three key target Republican groups that may be most fertile to this message and suggests that influencing this segment can shift overall public perception. The lack of urgency around the threat against the press is a major finding from the research — and indicates an uphill battle in terms of mobilizing the public to support the media. However, there is some hope. 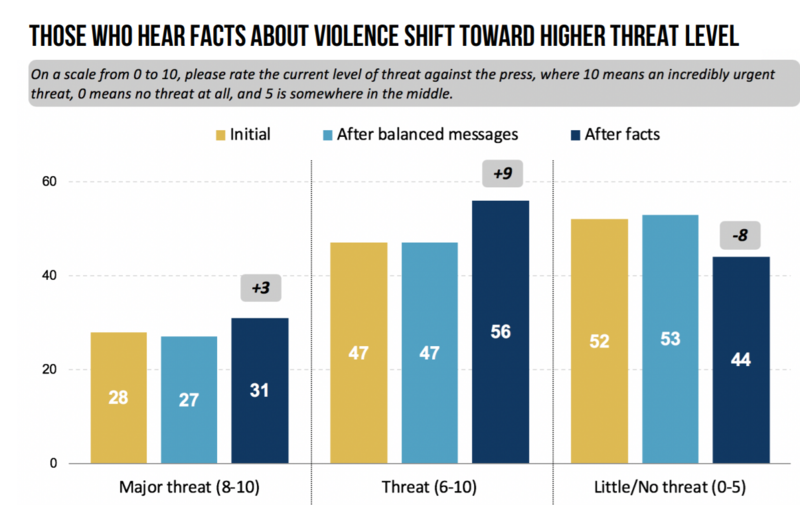 Researchers found that introducing facts about the threat journalists currently face shifts voters’ view and impacts the urgency with which voters see the situation. The resource found that most important thing the media can do to show they are a credible source is to acknowledge when they make mistakes and issue corrections. There is a sense that people are looking for real humility from the press, both in terms of how they deliver the news and inform, and in how they acknowledge any shortcomings or mistakes. As Jenn Topper, Communications Director, Reporters Committee For Freedom Of The Press wrote in the report, the larger concern is that a combination of current factors will be chips at the First Amendment and its protections for a free and independent press. If the public is conditioned to accept these gradual limitations on press freedom as normal — and in some cases even echo the attacks themselves, rather than vigorously defend against them — we are in a precarious position. Media organizations need to proactively address issues of trusts and focus on their role to inform the public – including informing them about threats to freedom of the press. News websites in Finland, France, Germany, Italy, Poland, Spain, and the UK are placing considerably fewer cookies without user consent post the implementation of General Data Protection Regulation (GDPR). According to Reuters Institute’s (RISJ) new research, Changes in Third-Party Content on European News Websites after GDPR (July 2018), news sites now have 22% fewer third-party cookies than they did prior to GDPR. This study’s findings add to RISJ’s earlier report, Third-Party Web Content on EU News Sites: Potential Challenges and Paths to Privacy Improvement (April 2018). The April research showed news websites tend to have a higher volume of third-party content and cookies than other popular websites. Websites often use third-party content for advertising and marketing purposes, for audience measurement, to optimize website design, to facilitate social media sharing, to recommend articles, and to host content such as videos. Many of these common third-party practices fall under the GDPR guidelines. The GDPR may require websites and third parties which collect user data to obtain user consent before processing the data collected. 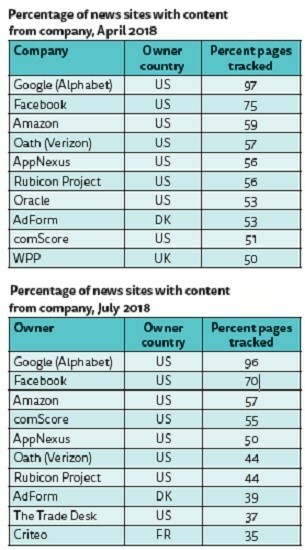 Reuters Institute utilized the webXray software to identify close to 500 different companies and services associated with third-party content across 200 news sites. News sites hosting third-party social media content, such as sharing buttons from Facebook or Twitter, dropped significantly, from 84% in April to 77% in July. On average, the number of cookies from design optimization tools is down 27%, advertising and marketing cookies down 14%, and social media cookies down 9%. Overall Facebook, and Amazon have the largest presence across the European news sites. Aside from Google, the overall reach of the 9 other companies (Facebook, Amazon, comScore, AppNexus, Oath, Rubicon Project, AdForm, The Trade Desk and Criteo) declined in July 2018 compared to April 2018. The findings presented here reflect site activity prior to obtaining consent. Importantly, these changes suggest that some news organizations are responding to GDPR either by obtaining consent for third-party tracking or by curbing the use of outside cookies in general. The research suggests that news sites recognized the potential risks posed by third-party content and removed it or ensured affirmative opt-in from their users.